All of the "action" centers around the complex trackage at Cajon Junction. 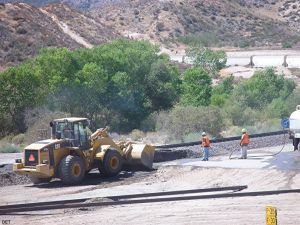 Don sends four of the work to complete Main # 2. 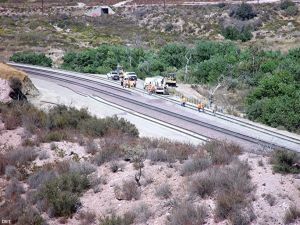 Photos 801 - 802: show the cutting of the road crossing to allow Main # 2 to be build through the area. 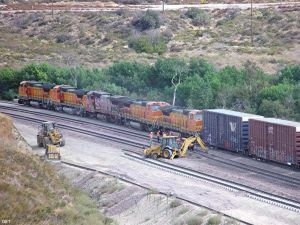 Photo 803: BNSF is EB on Main # 1 passing the unfinished # 2. Photo 804: Ballasting # 2 RR West of the curved bridge at MP 64.1X. 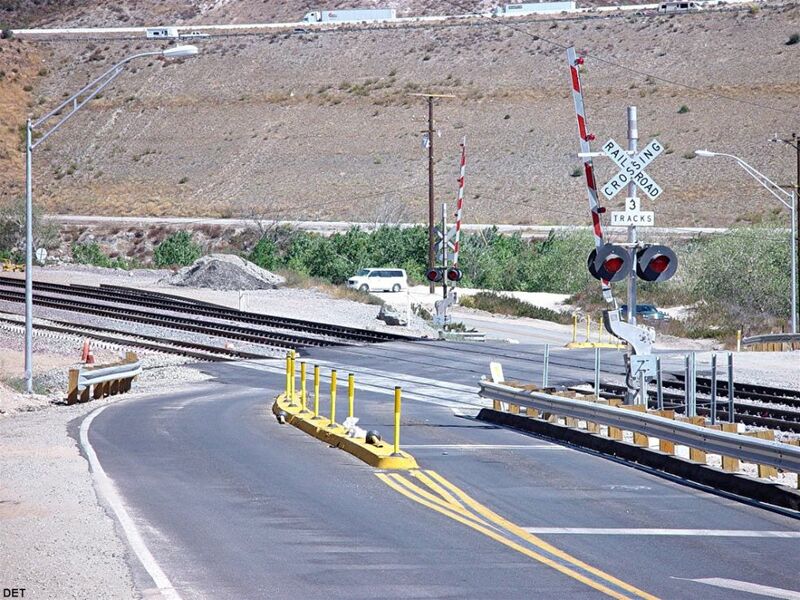 Note that all crossings and bridges have wooden ties since concrete ties do not wear well in those areas. 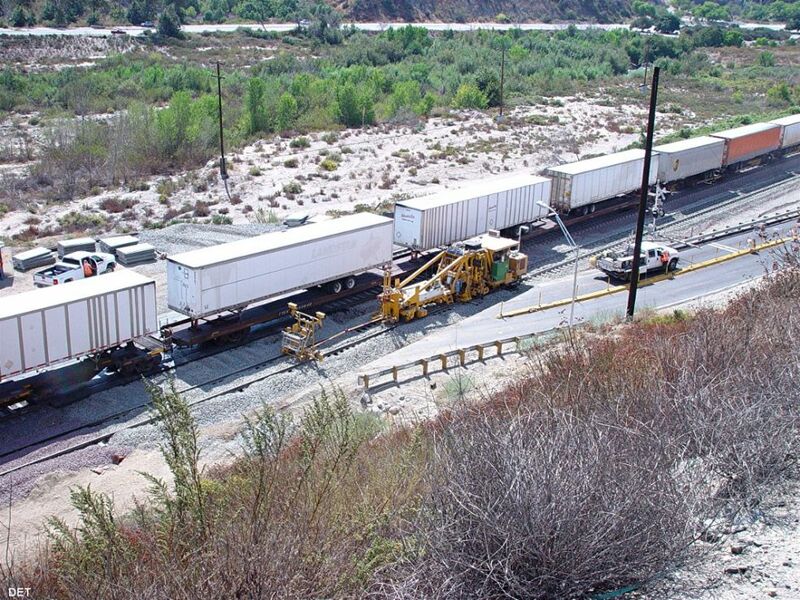 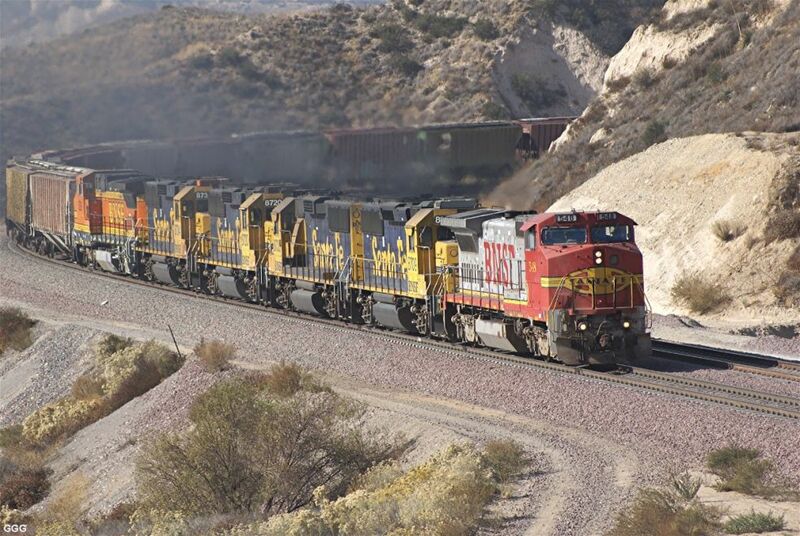 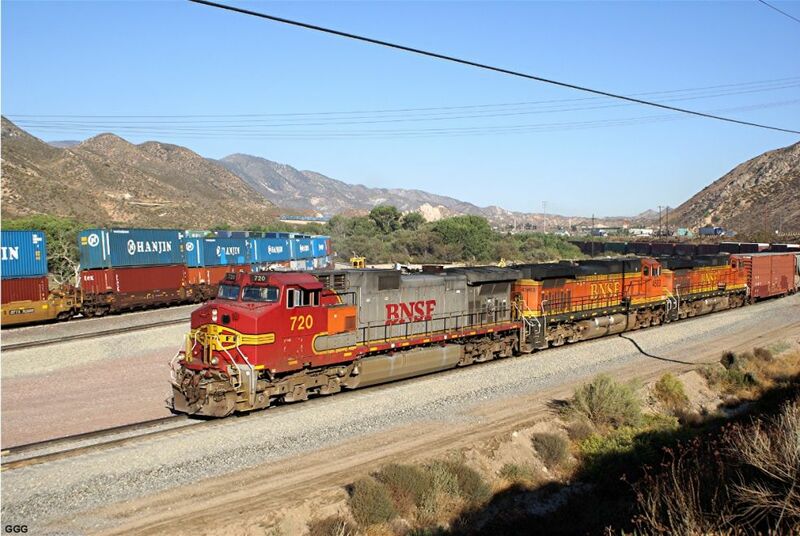 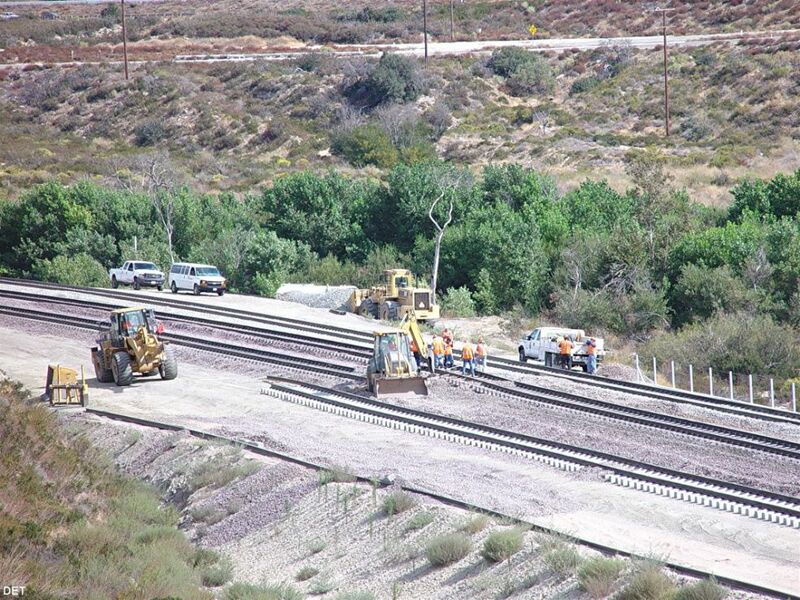 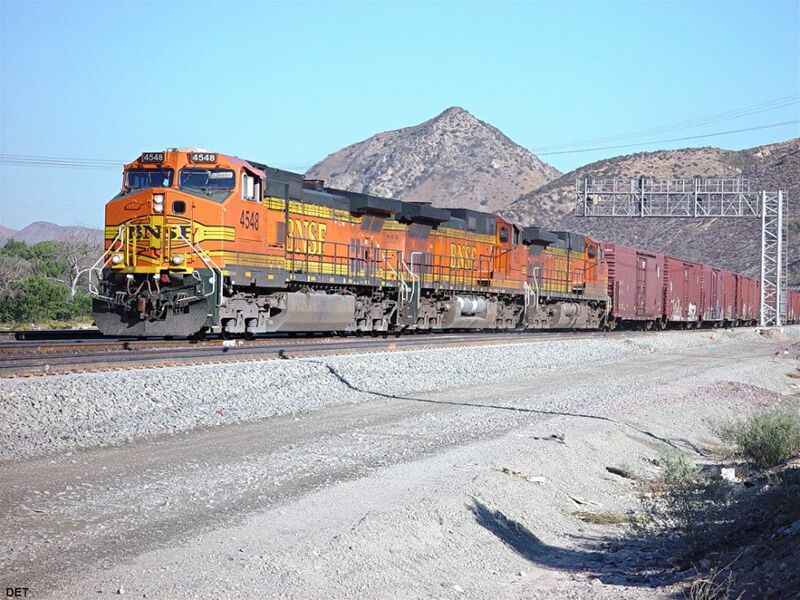 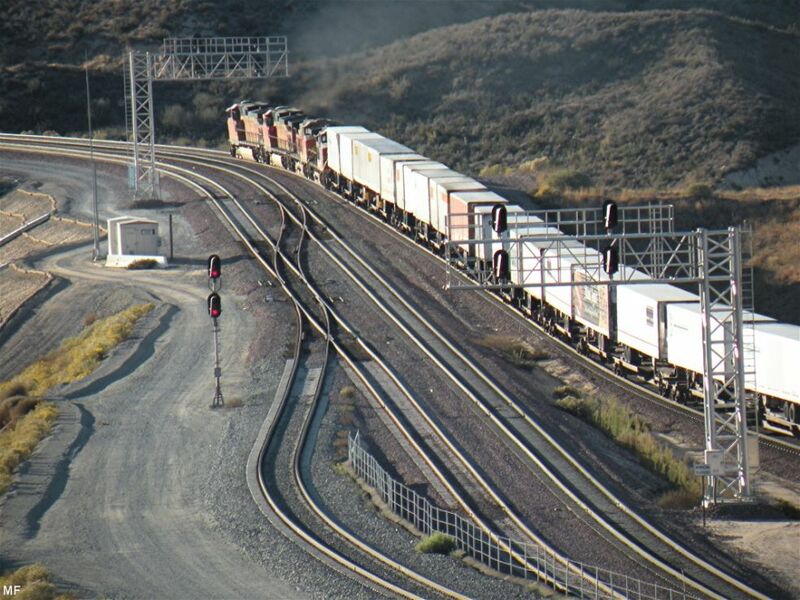 Yesterday (09-26-08), BNSF Main Tracks 1, 2, & 3 were opened between Summit and Cajon Junction. 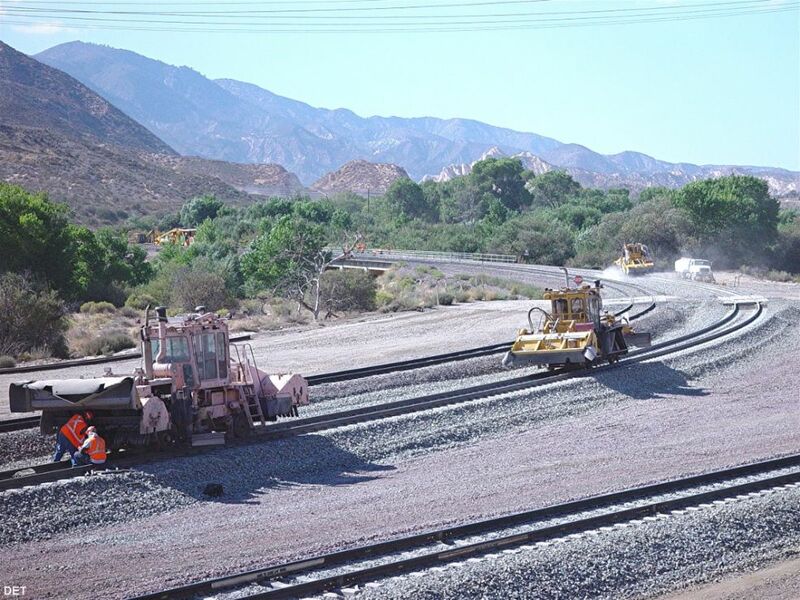 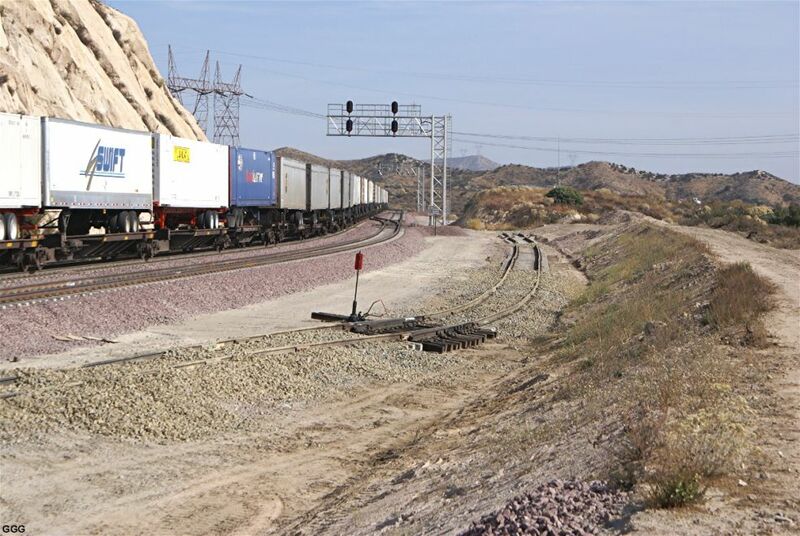 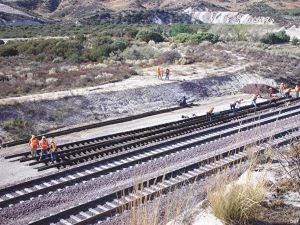 West of Cajon Junction, there is still a major track realignment to be finished next Monday. Photo 811: shows the present trackage between what we call " the graffiti bridge" at MP 63.4. and "Nasty Knoll" at MP 64.3. Photo 812: The "middle track" will be cut at the X and, obviously, 1 East and 1 West will be connected as will 2 E and 2 W. The curves as shown in these pictures are grossly exaggerated due to the long telephoto lens used. Photos 814 - 818: The BNSF has been running some really LONG (10,000 ft) trains lately and we're sure we caught one EB in the Cajon Station area. In our last series BNSF was cutting the tracks prior to realignment -- just RR West of the Graffiti Bridge at MP 63.4, Don, from above the UP/SP tracks, captures the process on 29 Sep 08. 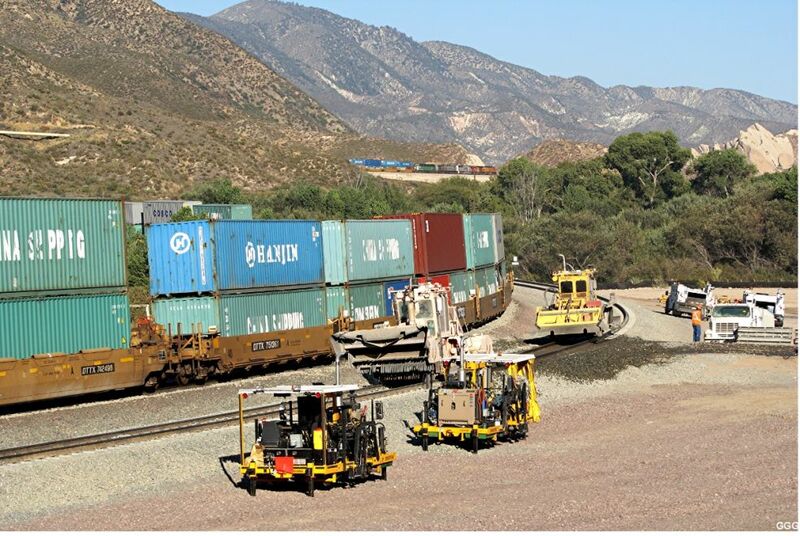 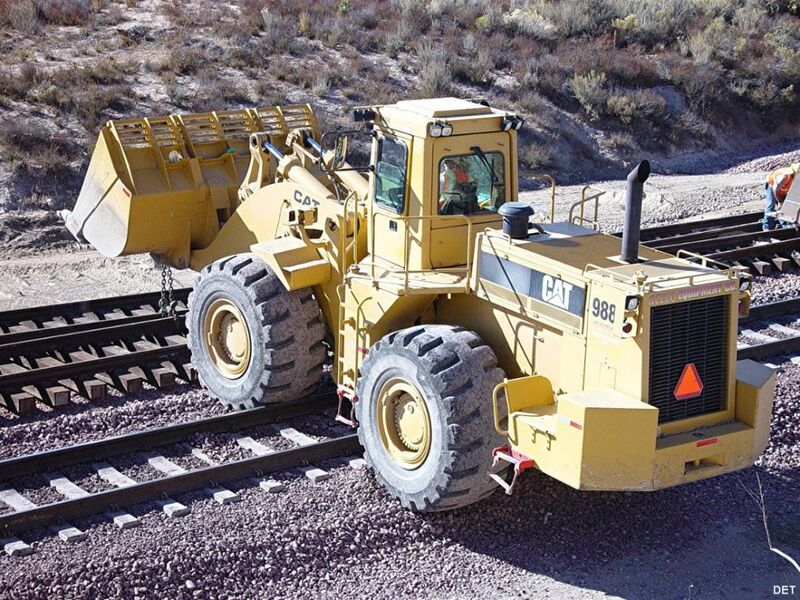 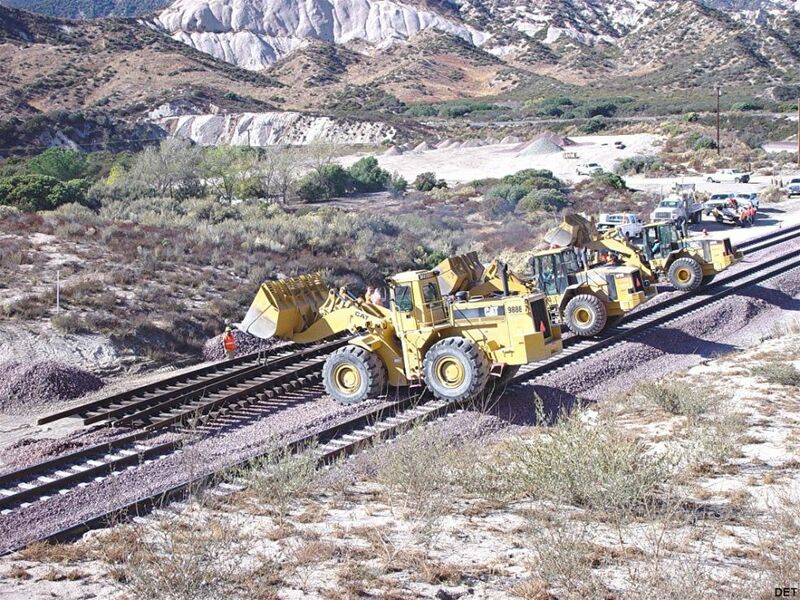 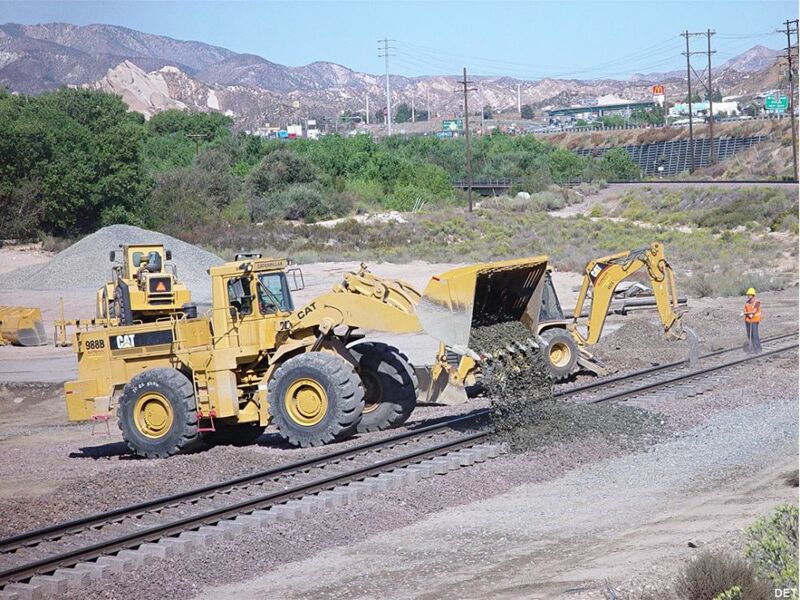 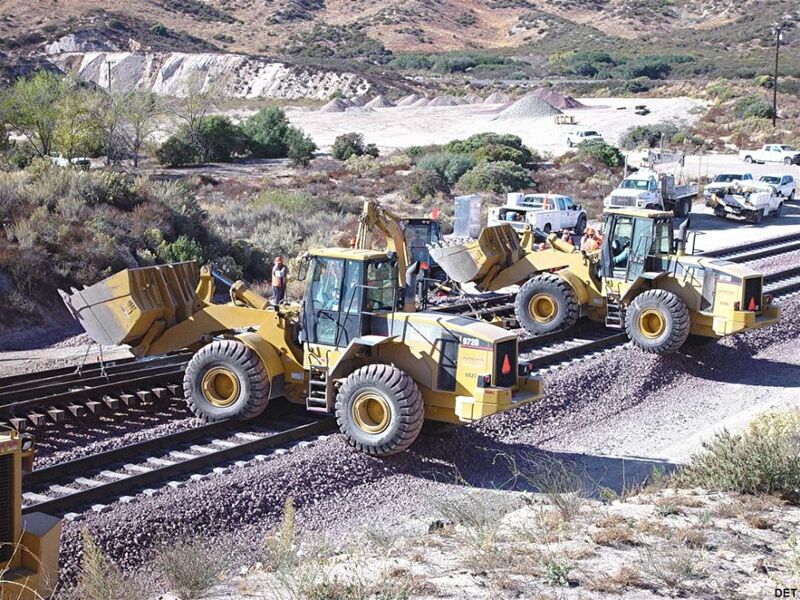 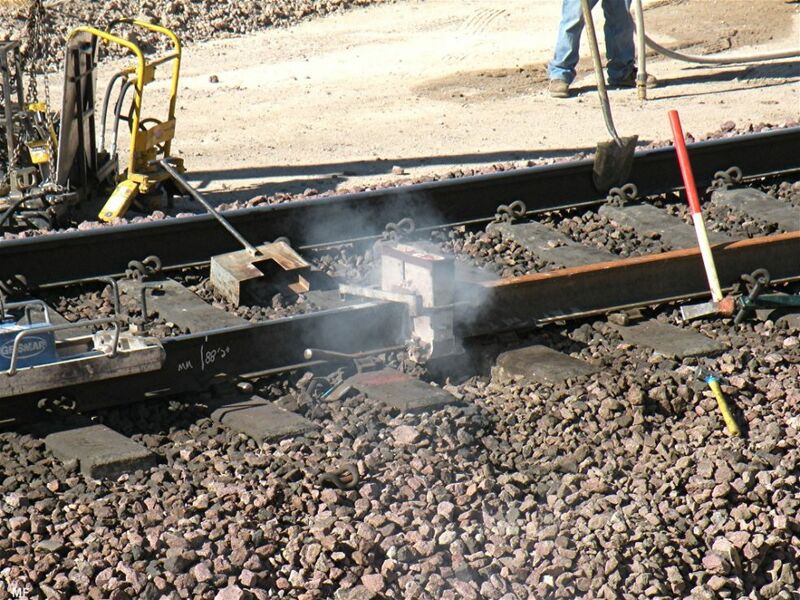 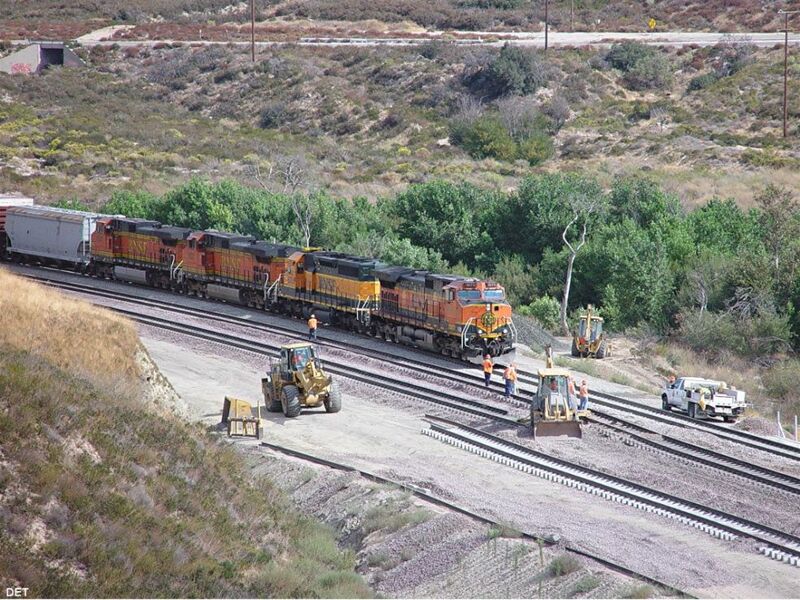 Photos 819 - 824: show realignment, ballasting and dressing of Main # 2 in different stages. As we can see on photos 821 - 824 Main # 3 was really busy while Mains # 1 and # 2 are out of service. 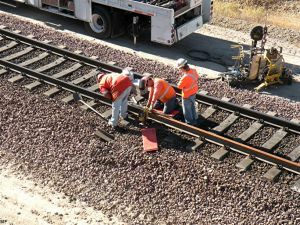 Main # 1 is still not connected at this time. 10/18/08 - Current status of the 3MT Construction: All three BNSF tracks are in operation between Summit and Cajon Junction. 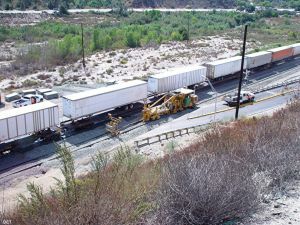 Main # 1 from Cajon Jct to Keenbrook was not operational as of yesterday (10/17/08). 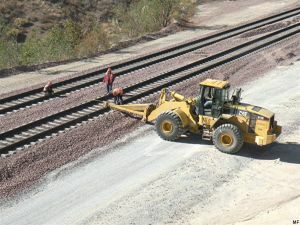 We think that all will be finished by the end of October ?? 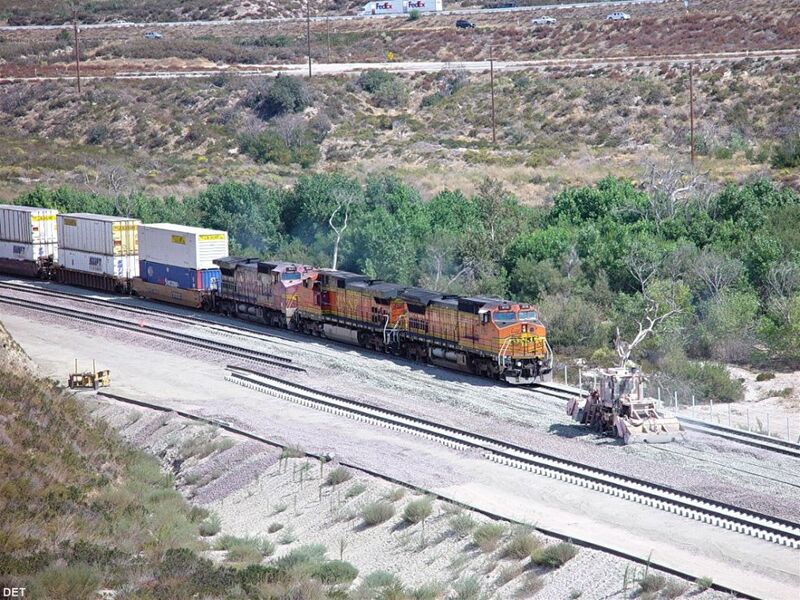 Friend Marc Fournier joined the digital imaging age and caught this meet at Cajon Jct. 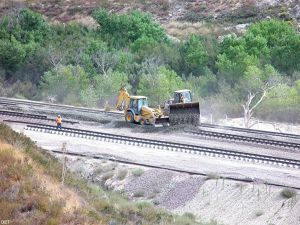 Even these photos do not show anything about the current construction, we think, it is worth to see especially of their wide screen format. 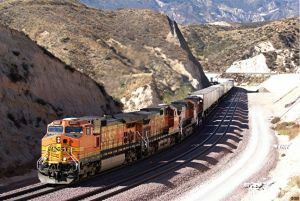 Photo 840: BNSF 7491 is WB on Main # 2 while the DPU's of an EB climb toward Sullivan's on Main # 1. 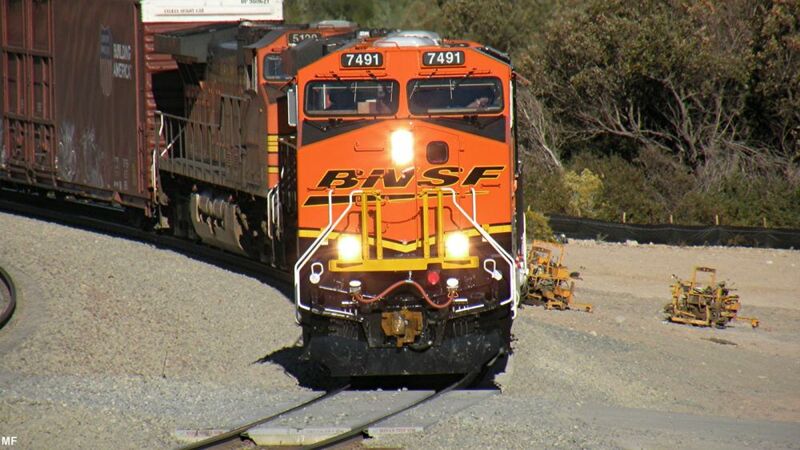 Photo 841: Show close up of BNSF 7491 WB at Cajon Junction. Photo 842: The BNSF EB double stack train (coming out of Sullivan's Curve) is still visible above the WB train. 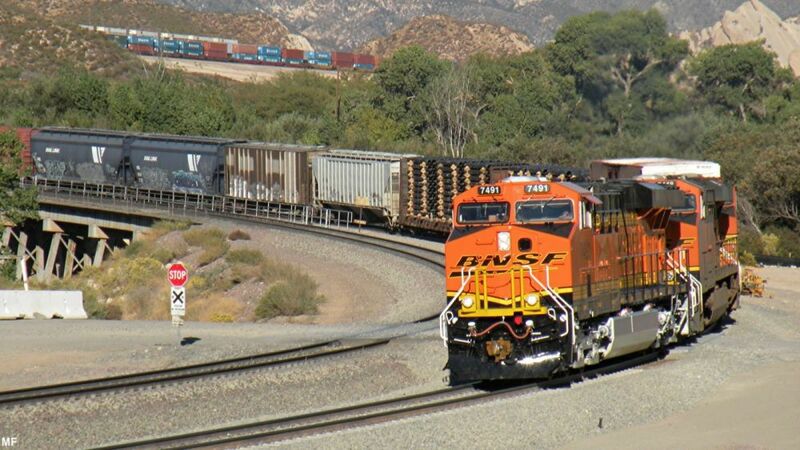 Photos 843 - 844: BNSF 6735 is WB on Main # 1 at Cajon Junction - with the last (we think) of the new ballast for that track at RR West between Cajon Jct and Keenbrook. Photo 845: BNSF 7641 is EB toward Sullivan's Curve passing the above mentioned ballast train. Photos 846 - 850: As you may remember, a shoo-fly was built to by-pass Tunnel-1 (BNSF MP 59). 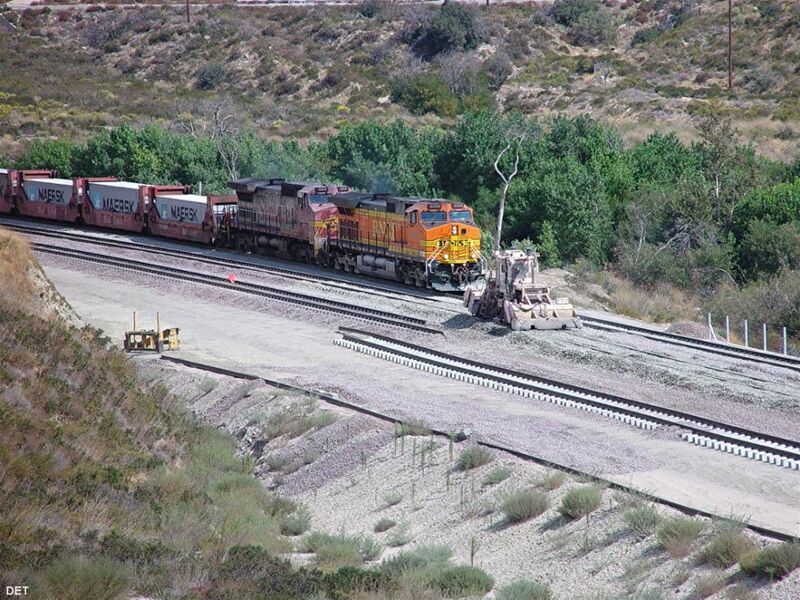 The last major sub-project within the BNSF 3MT construction was to realign the shoo-fly to parallel Main # 2 (M-2) in the former T-1 area. Marc sends the beginning of the realignment looking west as of 11-05-08. 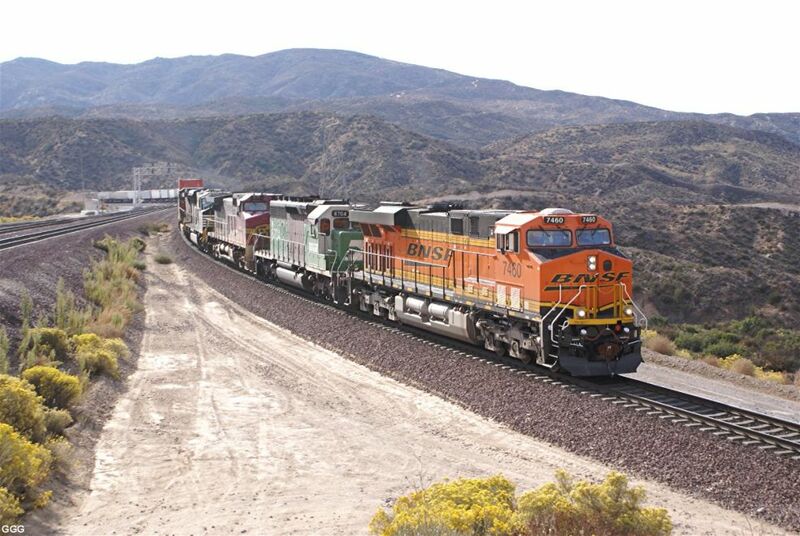 11/07/08 - Victorville Daily Express: BNSF has declared the BNSF 3MT project FINISHED ! 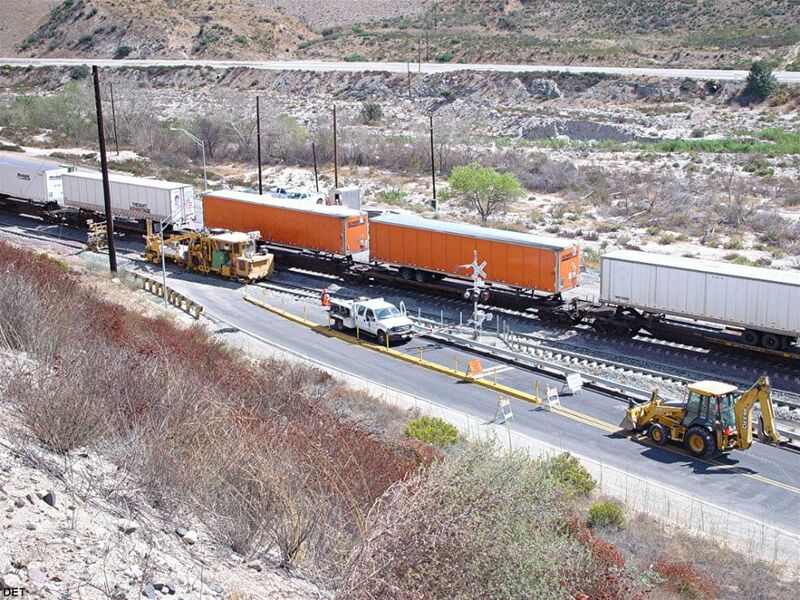 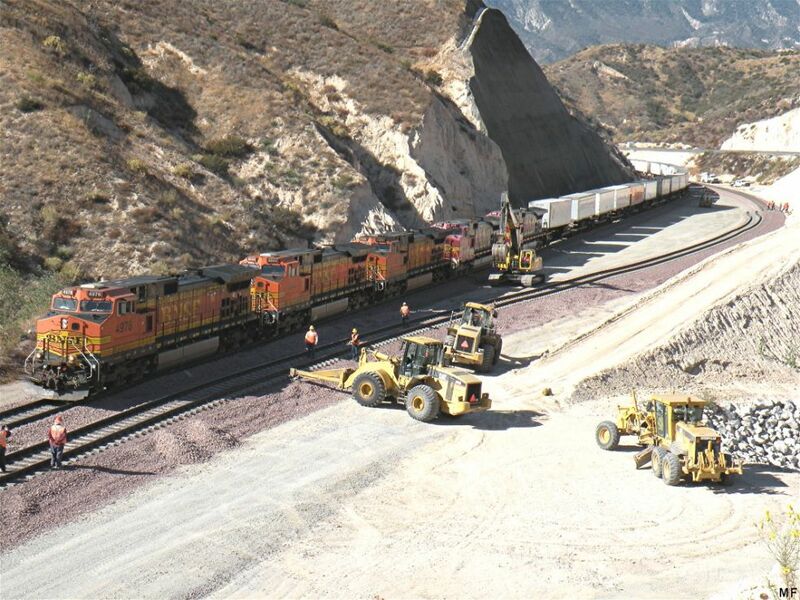 CAJON PASS • BNSF Railway has completed construction of a third main rail line through the Cajon Pass, which will help take more trucks off the freeway. 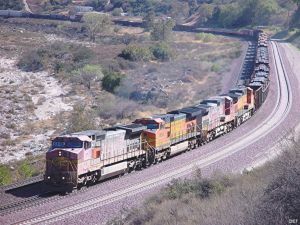 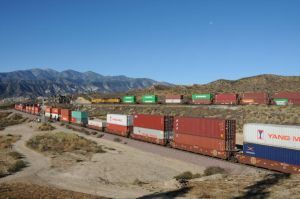 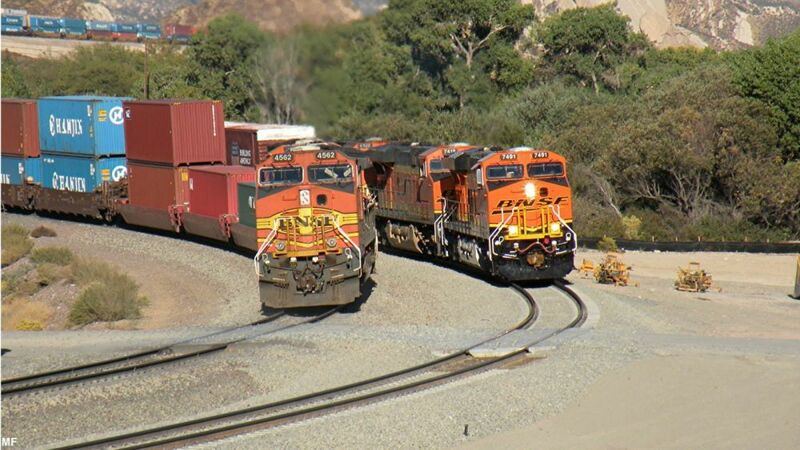 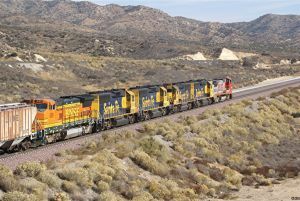 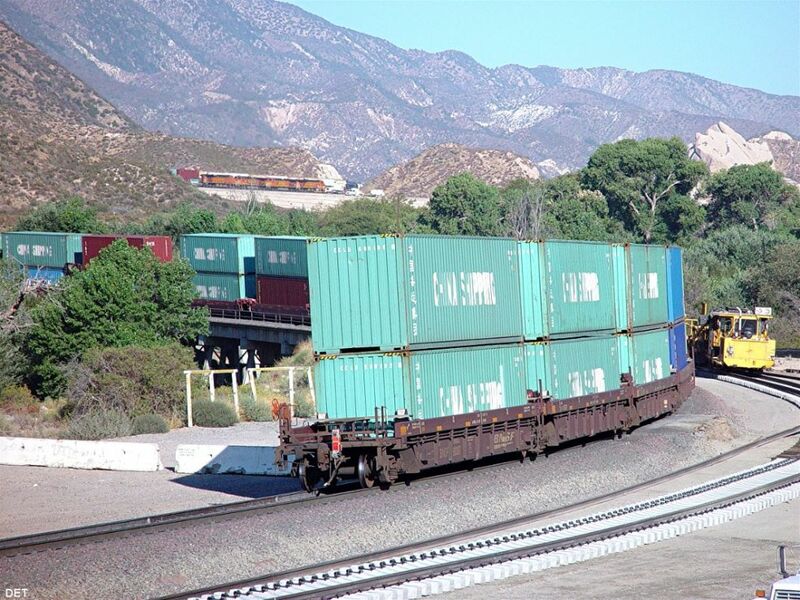 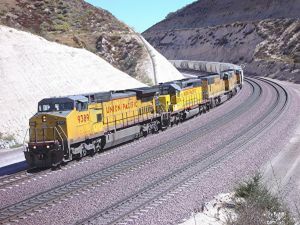 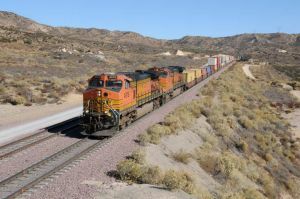 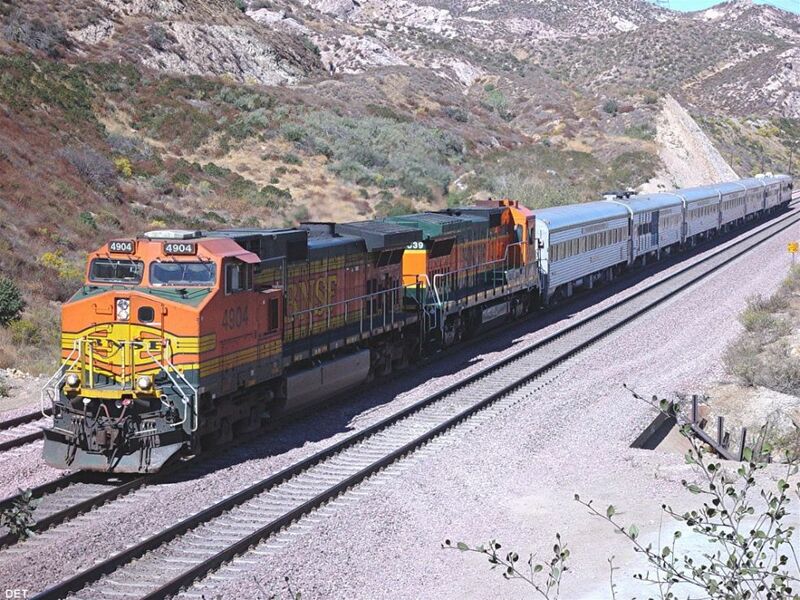 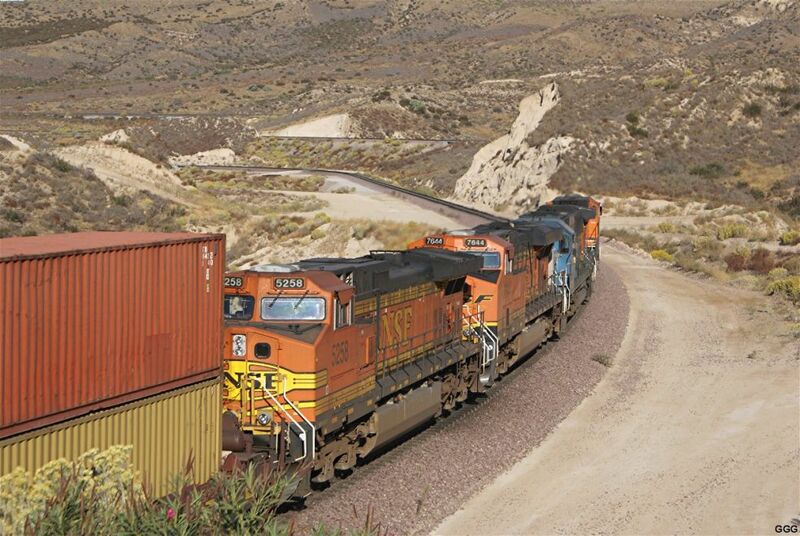 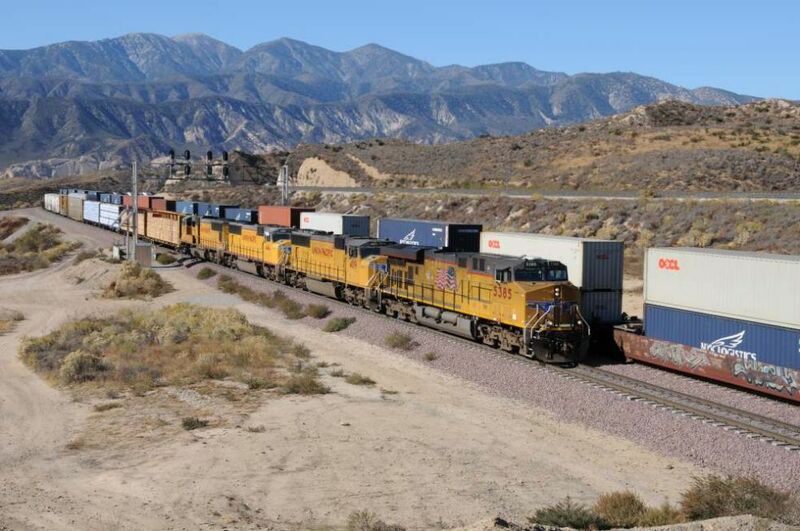 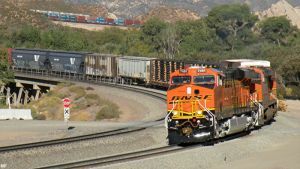 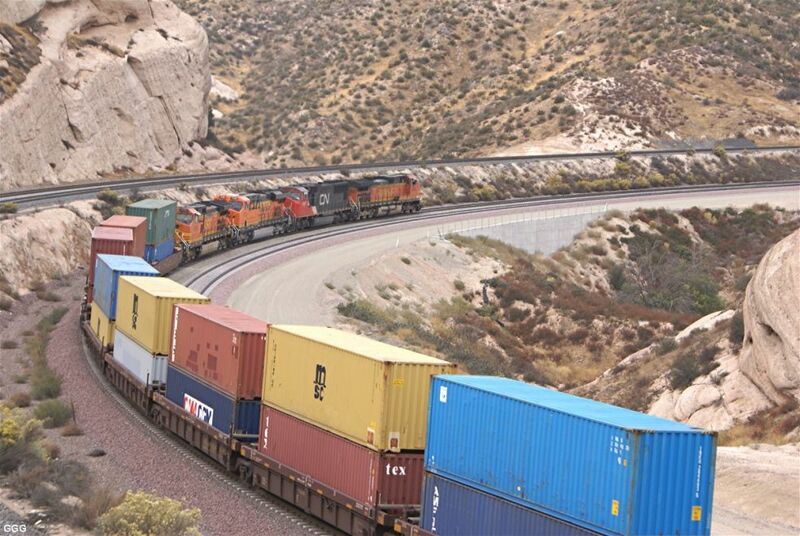 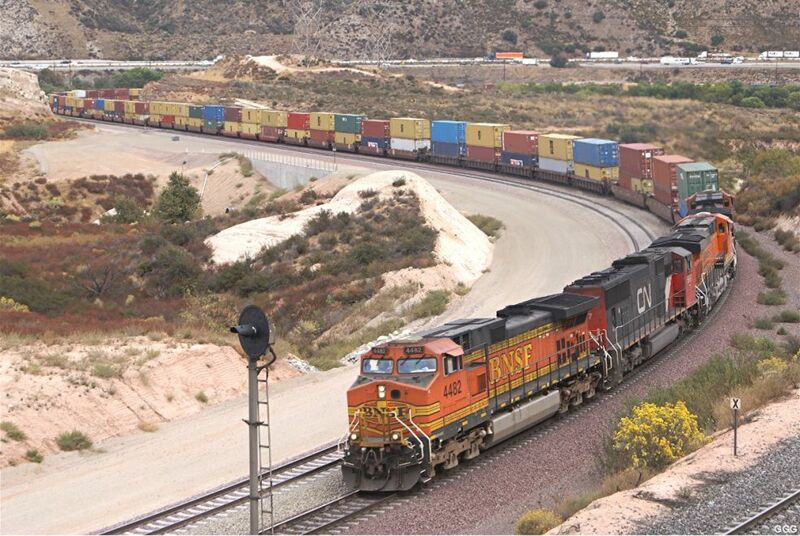 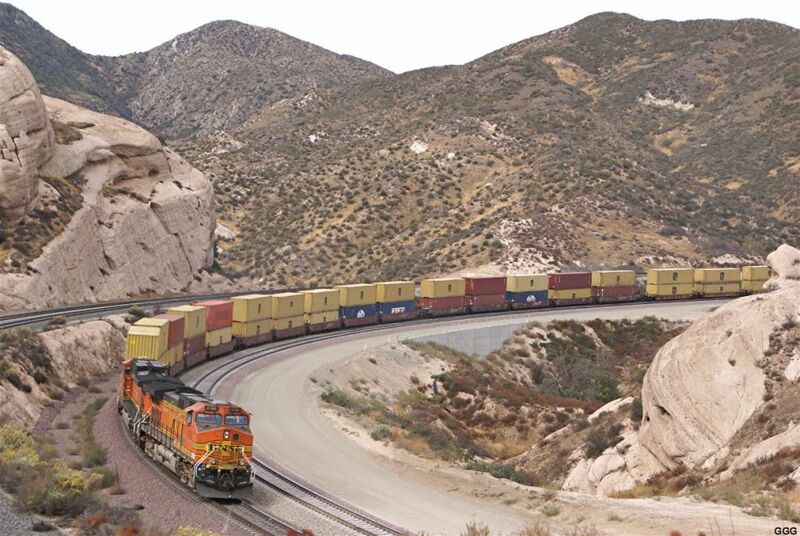 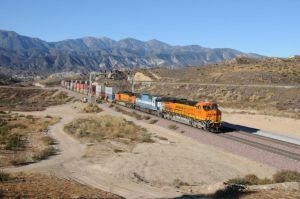 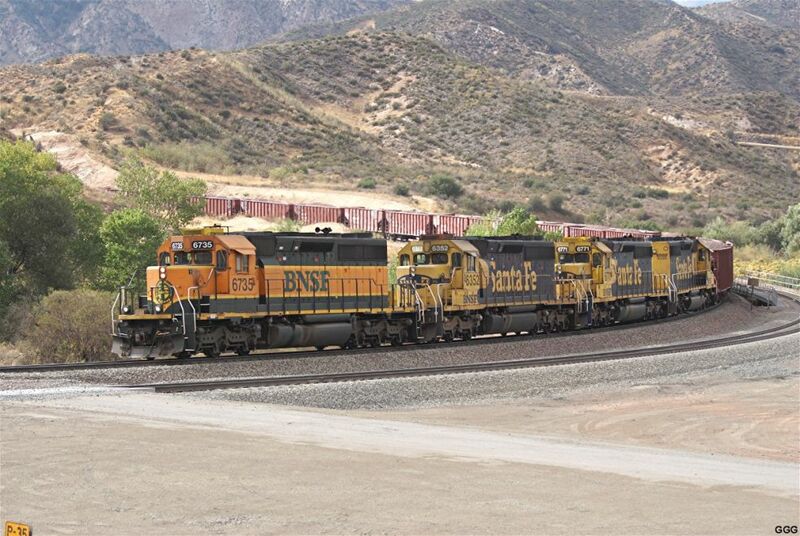 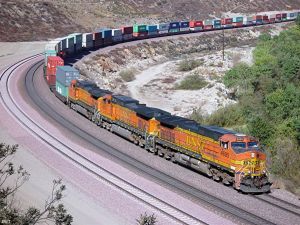 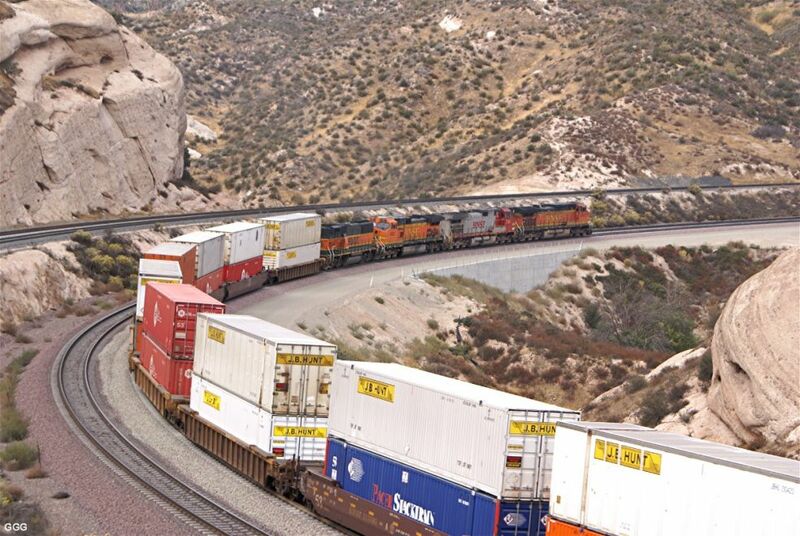 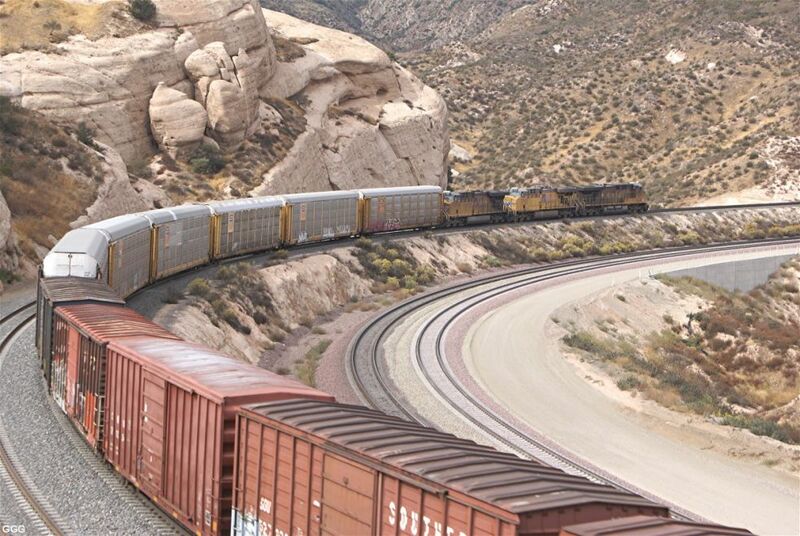 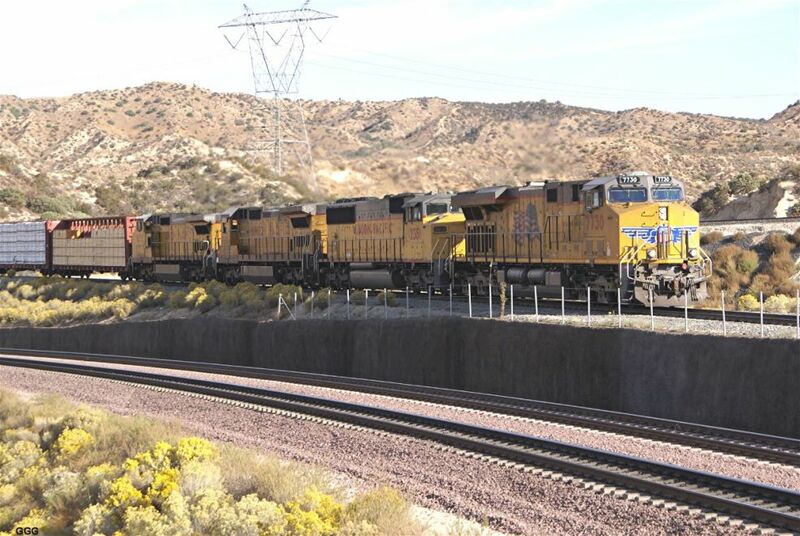 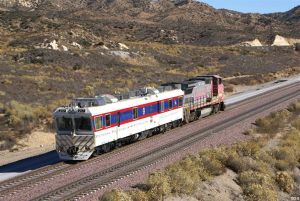 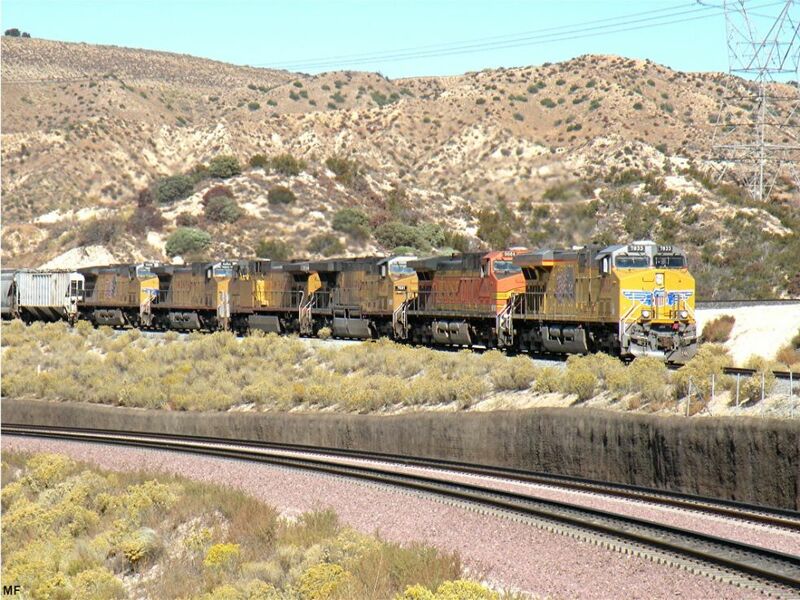 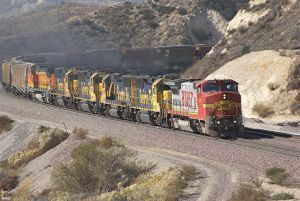 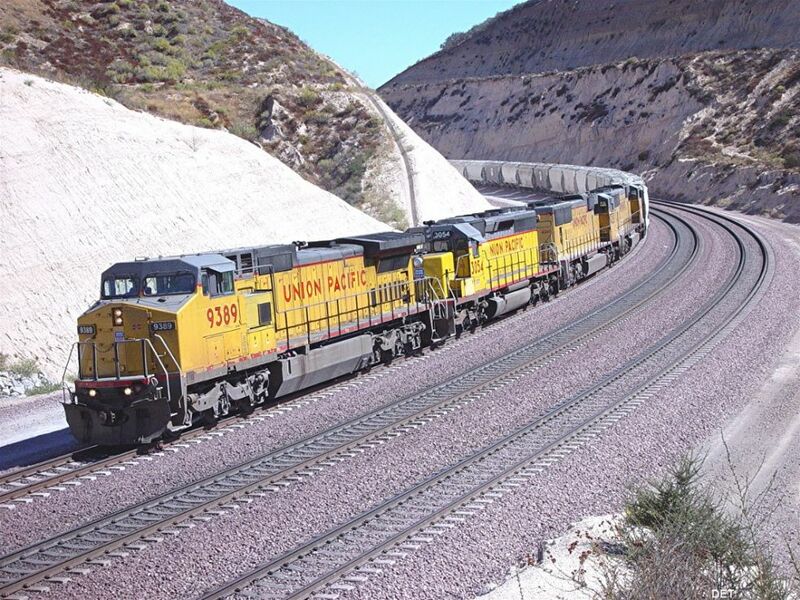 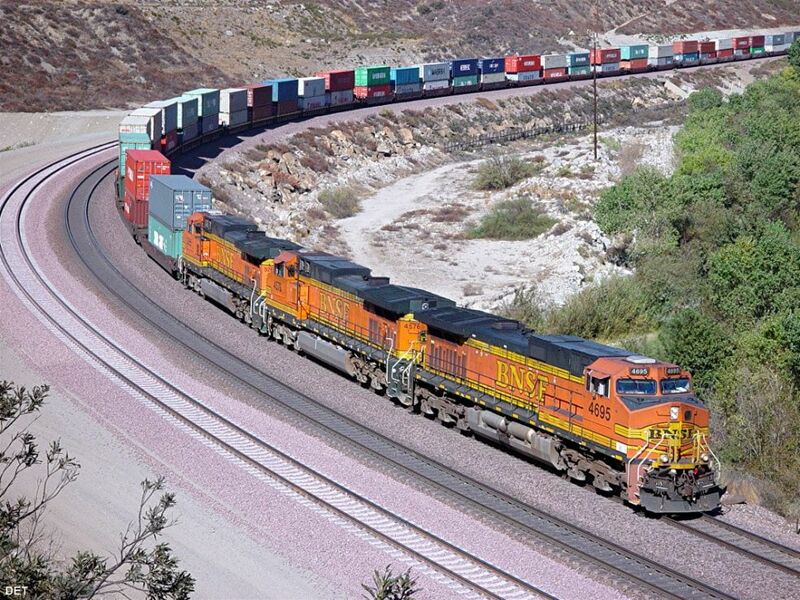 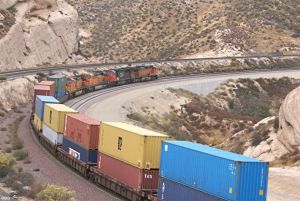 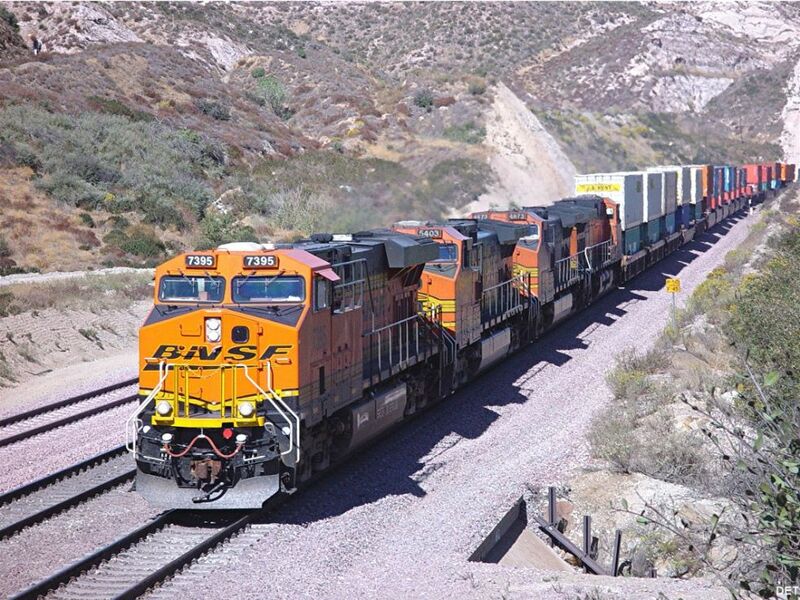 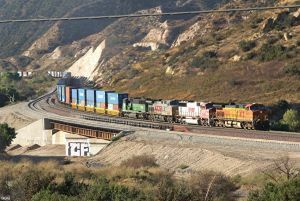 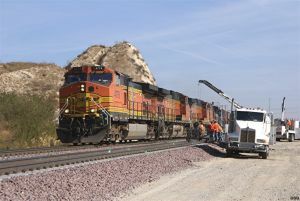 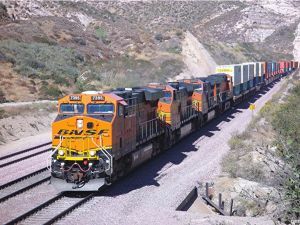 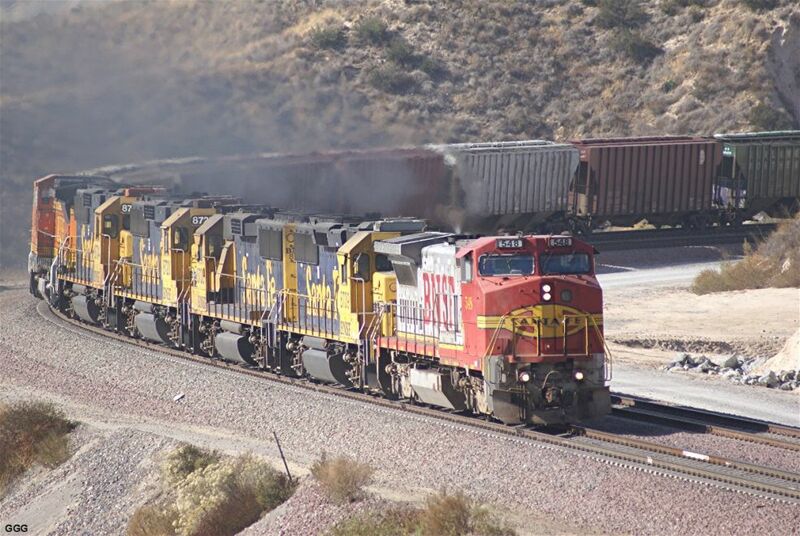 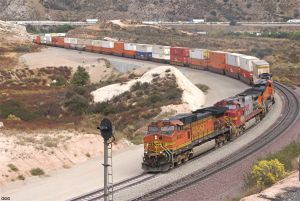 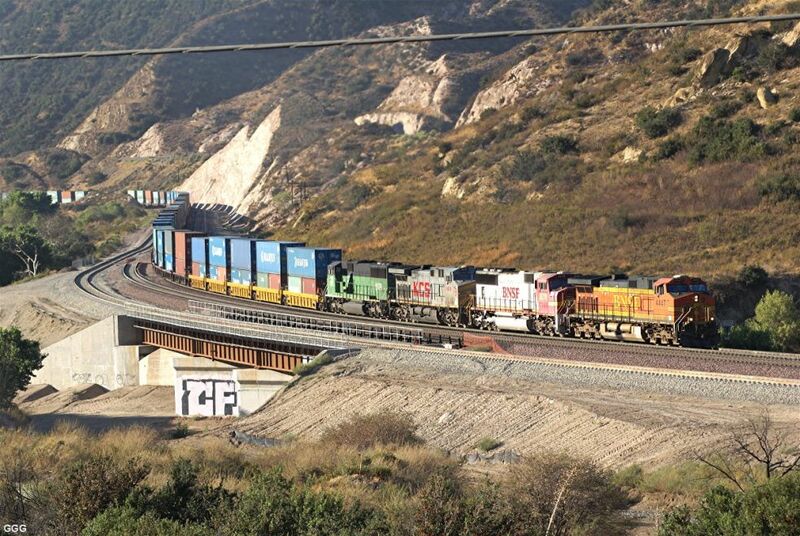 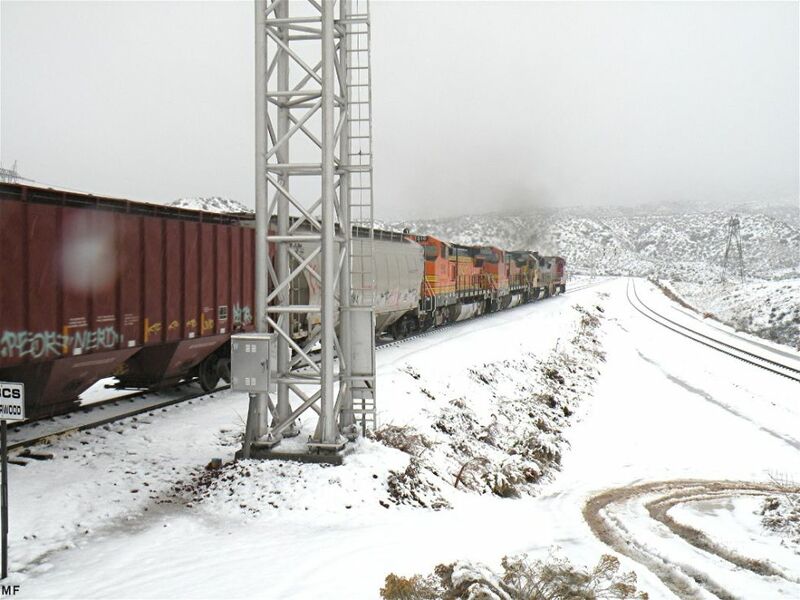 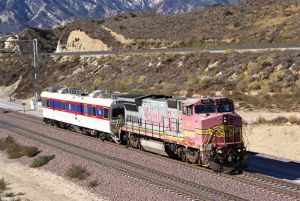 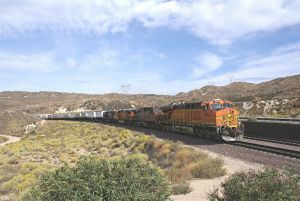 The $90 million, 16-mile new line will increase capacity on BNSF’s Chicago to Los Angeles transcontinental route from 100 to 150 trains a day, according to the company. 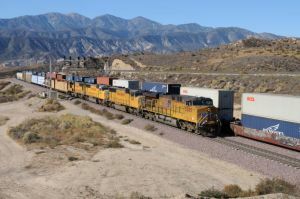 Each intermodal train on these tracks can take more than 250 long-haul trucks off of the region’s local highways and move one ton of freight more than 400 miles on one gallon of diesel fuel. 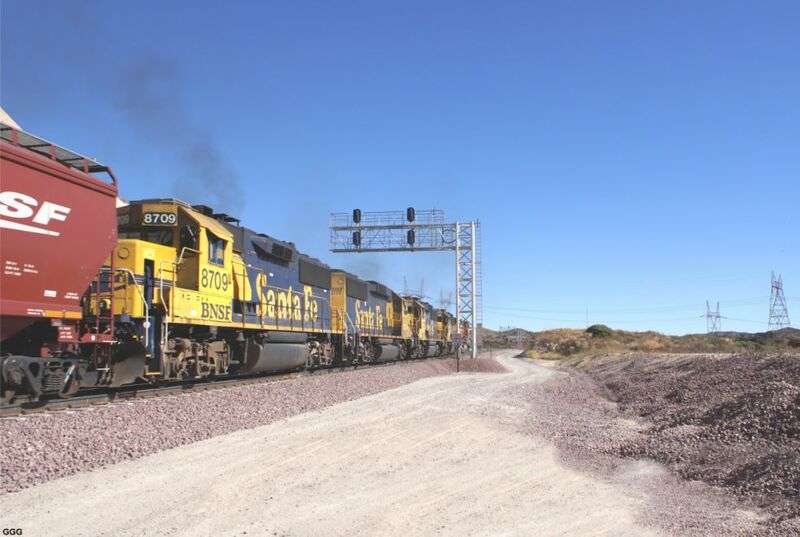 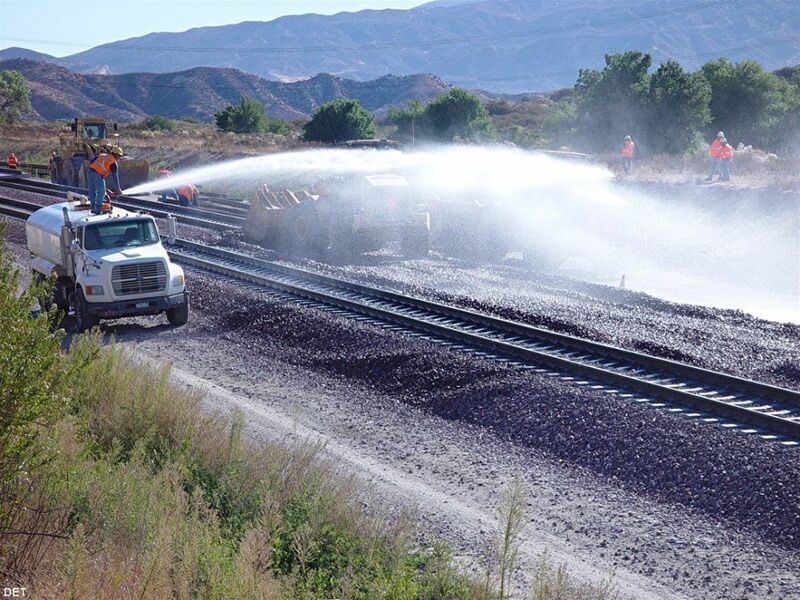 BNSF worked with at least 17 public agencies, six utility companies and the community on issues ranging from enhancement and protection of the environment, to improved grade crossings, drainage structures and preservation of historical and cultural resources. 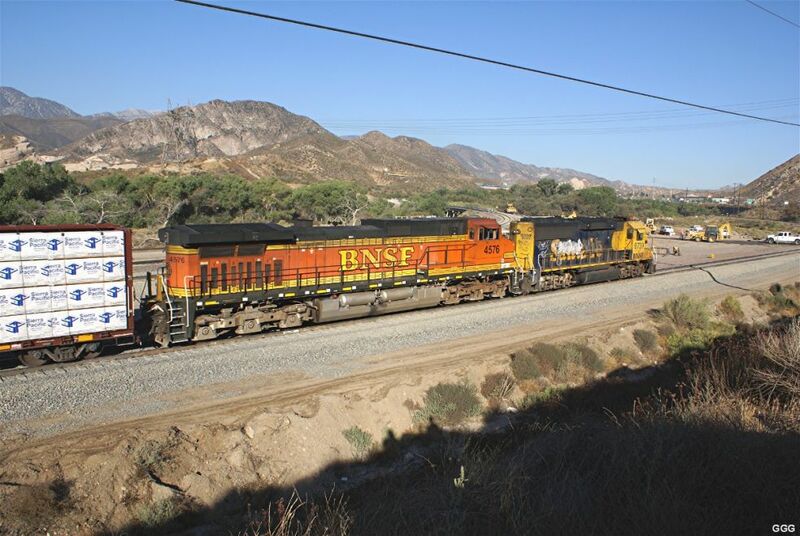 Over the past four years, more than 300 BNSF employees and contractors worked on the Cajon Pass project. In that time, crews moved more than 1 million tons of earth, placed approximately 42,000 concrete railroad ties, and laid more than 30 miles of steel rail. 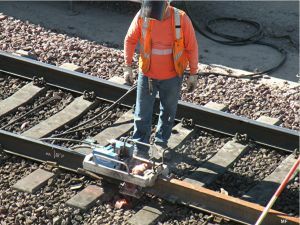 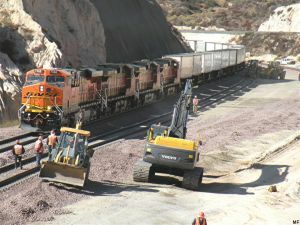 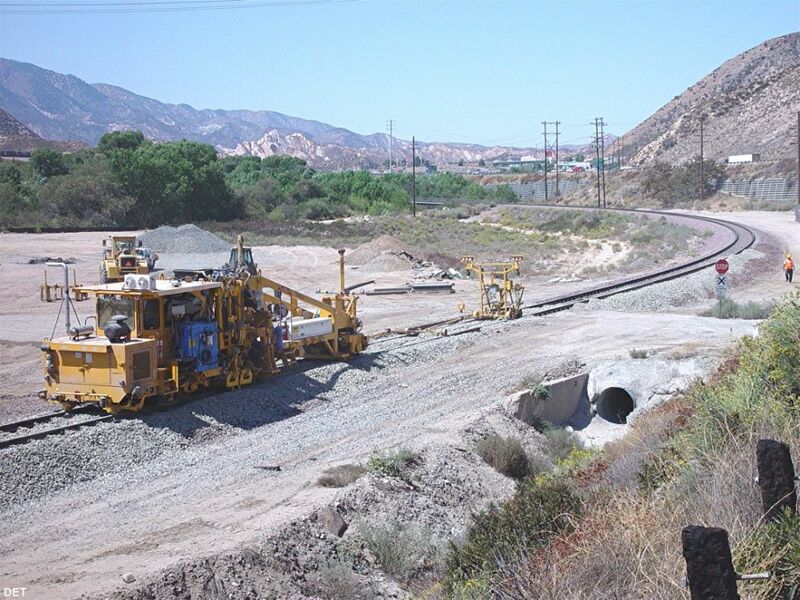 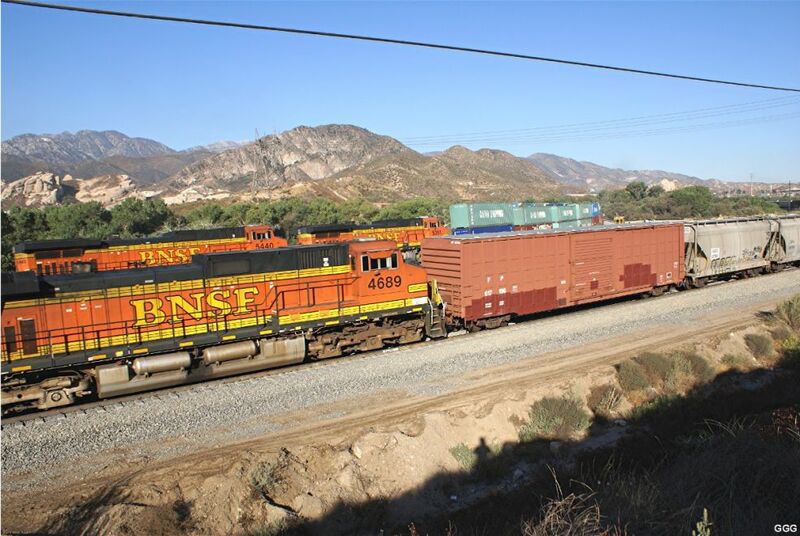 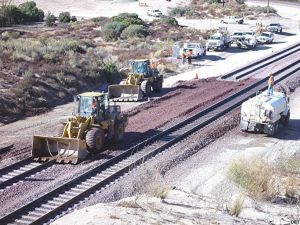 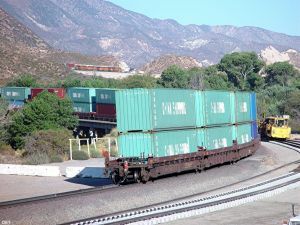 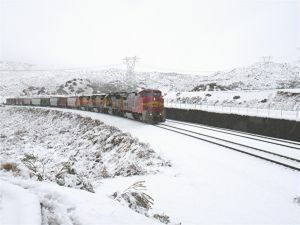 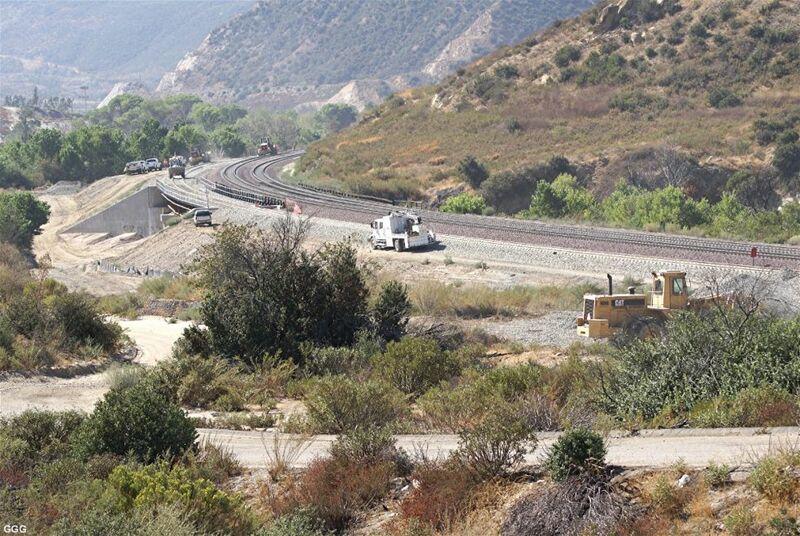 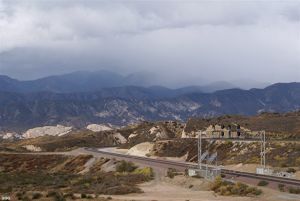 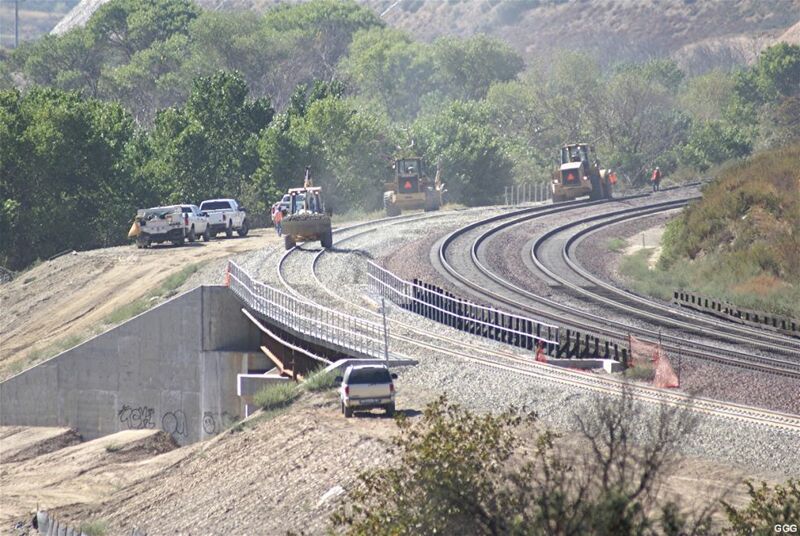 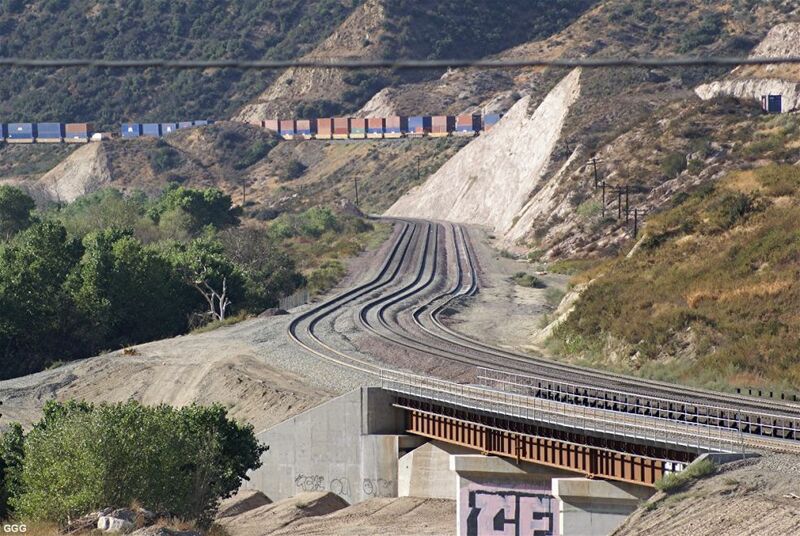 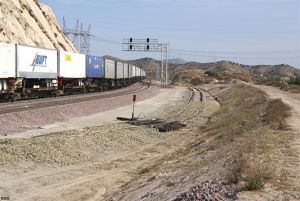 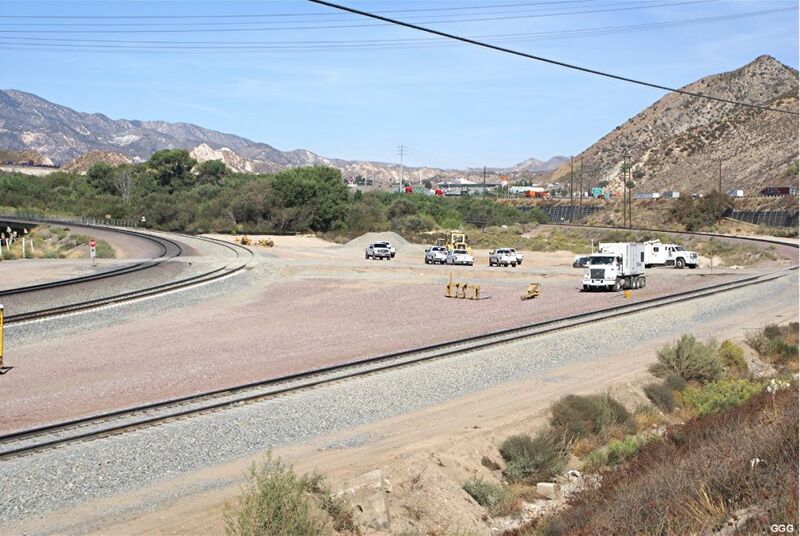 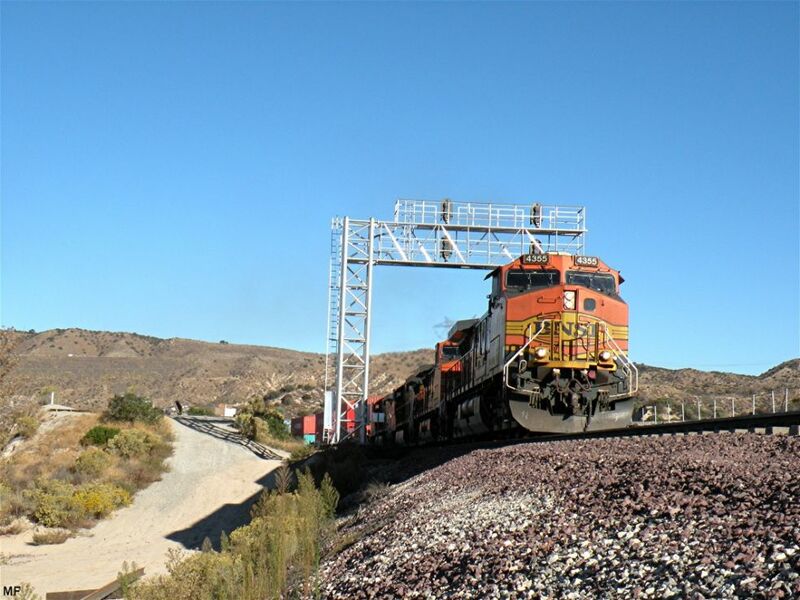 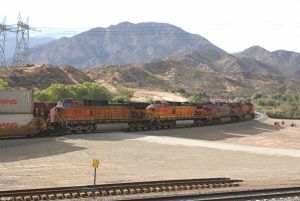 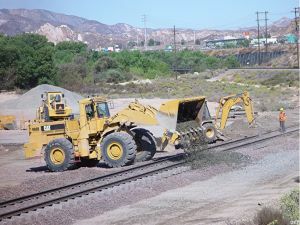 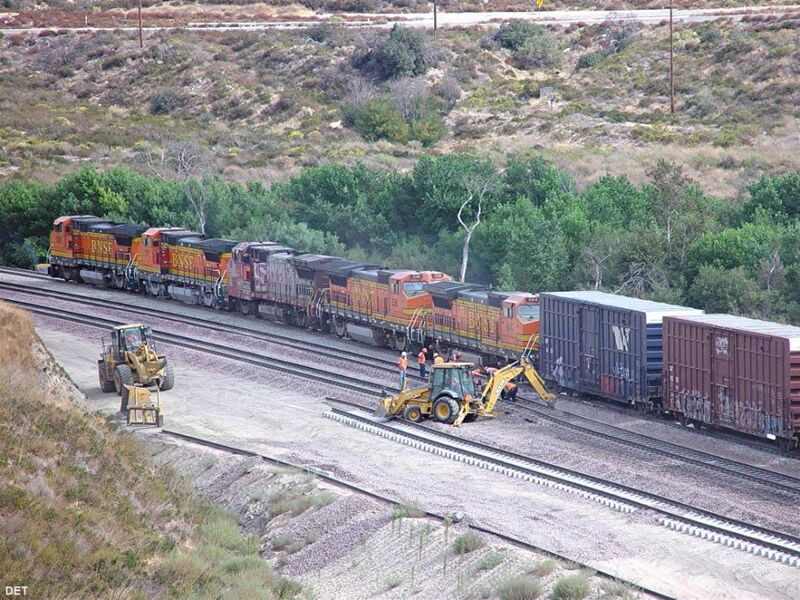 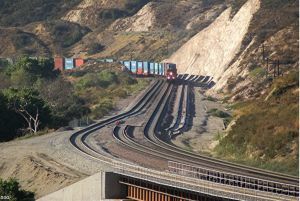 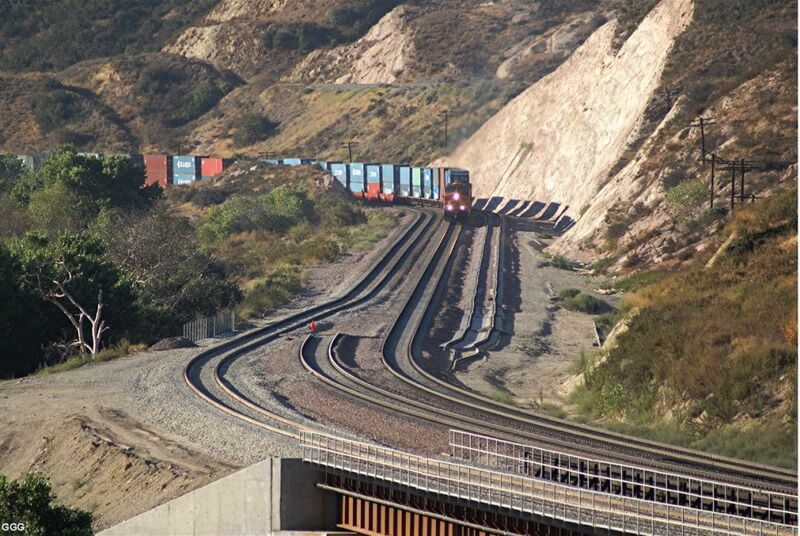 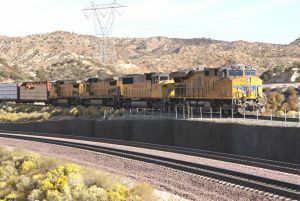 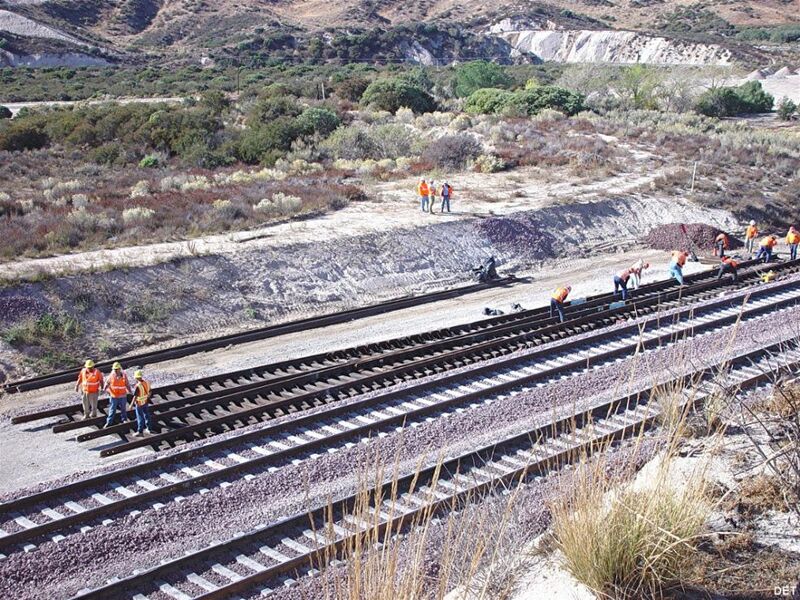 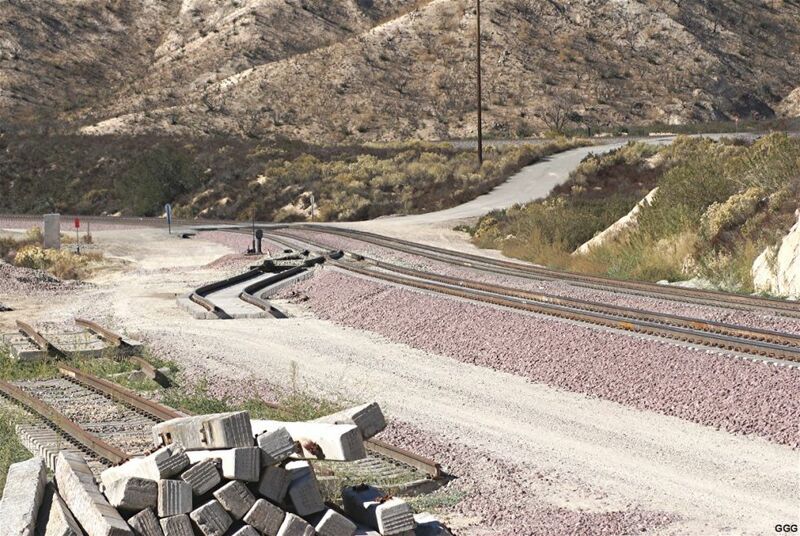 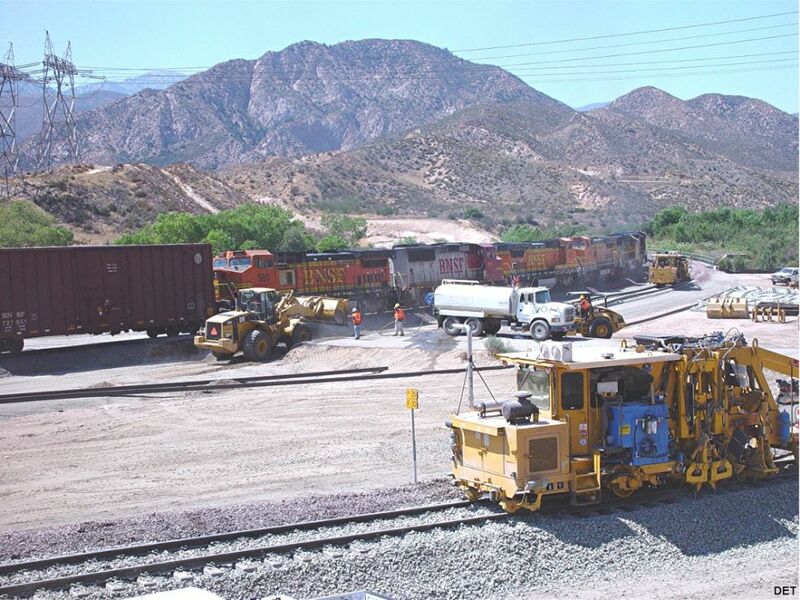 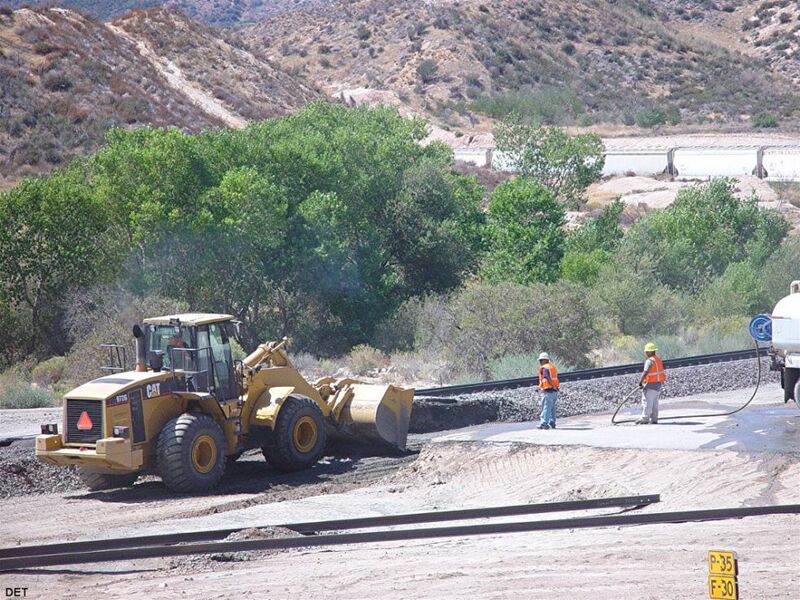 The construction of the third track represents the first BNSF main track addition through Cajon Pass since the second line was constructed in 1913. 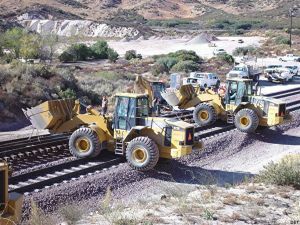 It seems that there is a 'Construction project of the year' competition conducted by the Associated General Contractors of America. 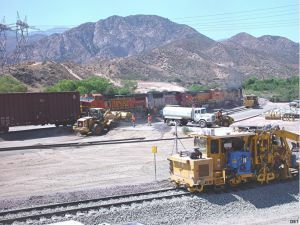 Ames Construction (the corporation which teamed with BNSF to move the dirt, build the bridges, and remove the tunnels) contracted with the PR firm (Kaneen Advertising & Public Relations, Inc. of Tucson, AZ) to enter the competition. 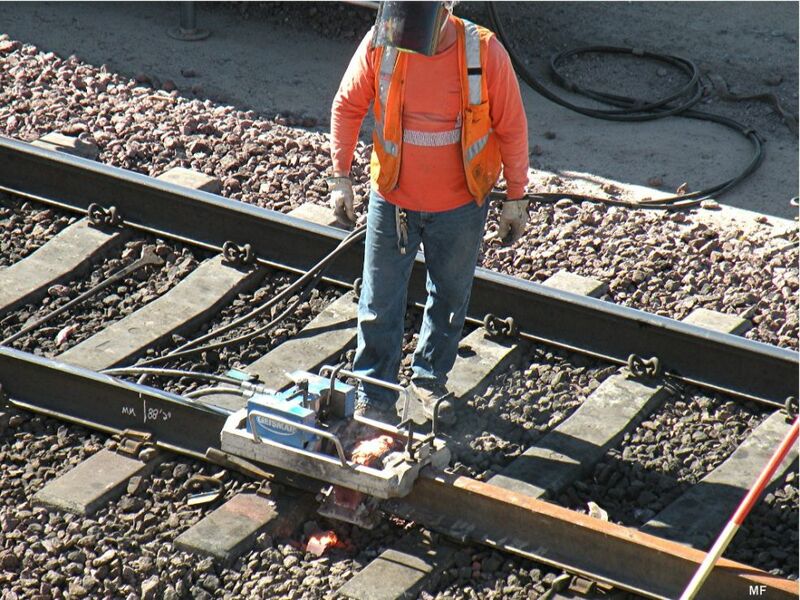 Below is a description (PDF) of the competition for the 2009 AON Build America Award. 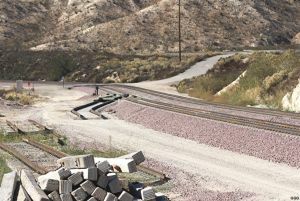 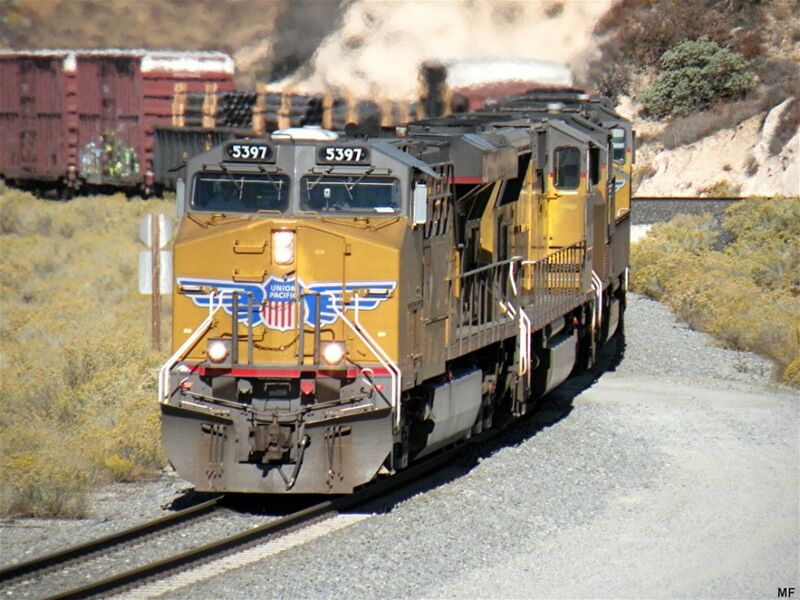 Photos 851 - 854: The Silverwood Connector is a crossover between the UP (Palmdale cutoff) and the BNSF tracks # 1 and # 2. 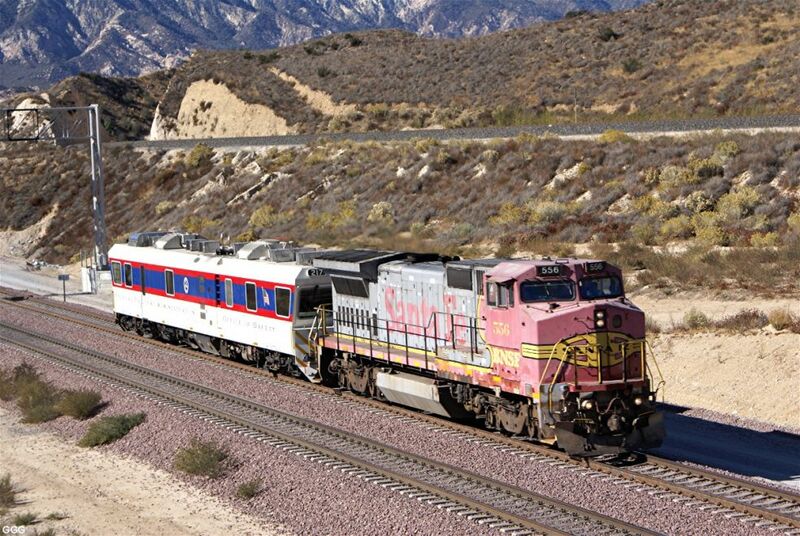 Therefore, UP is able to re-route trains between the tracks heading to either Palmdale (Tehachapi) or Barstow (Daggett) and further North. 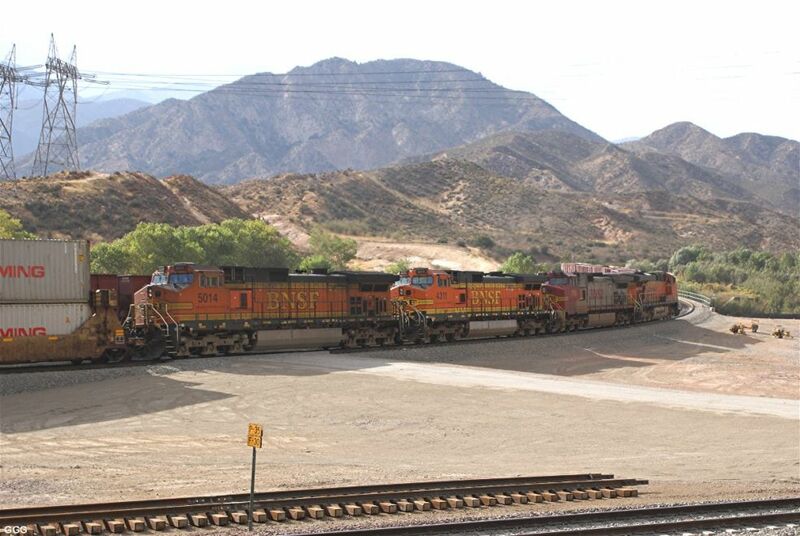 The other way around, WB trains coming from Barstow can change to the UP tracks heading direct into Colton Yard. 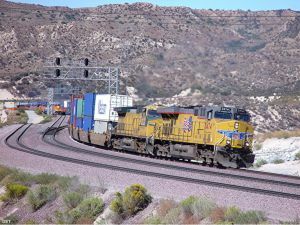 Photos 851 - 852 show 2 diff. UP trains crossing from UP to BNSF tracks. 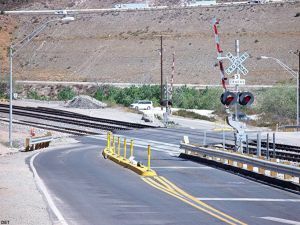 Photo 853 shows another railfan's over look in the Pass: West Summit Island (WSI). 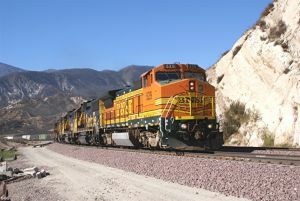 It is located between BNSF track # 3 and # 2, just below the Summit Curve. 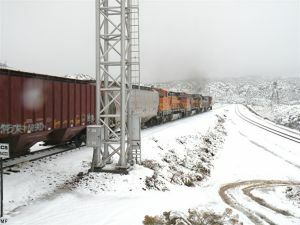 Photo 854 shows from left to right: Silverwood Connector, BNSF Main # 1, # 2 and # 3 with BNSF EB train entering Summit Curve. 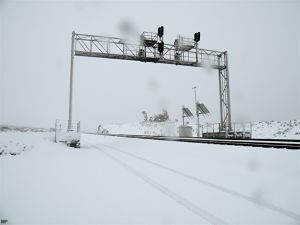 West Summit Island is just at the right lower corner (not visible). 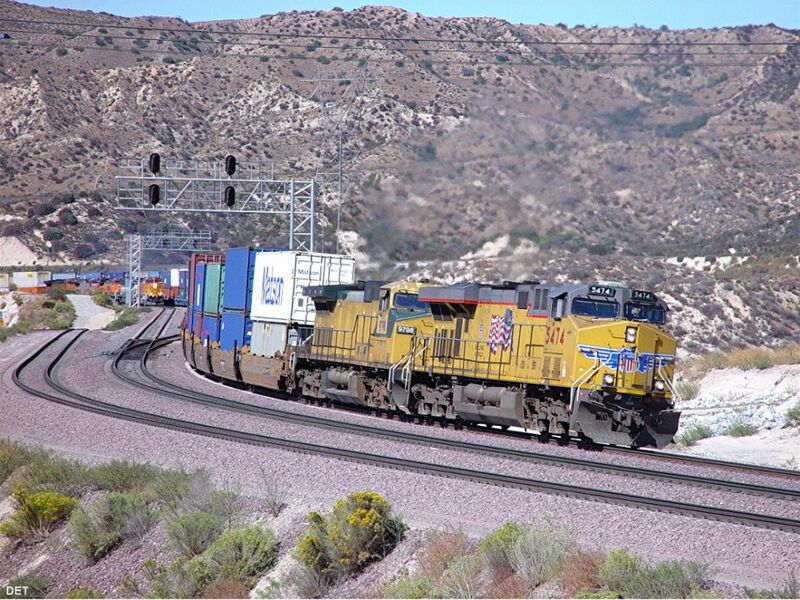 As the 3MT project is finished, we are going to show great photos of the daily operations in Cajon Pass. 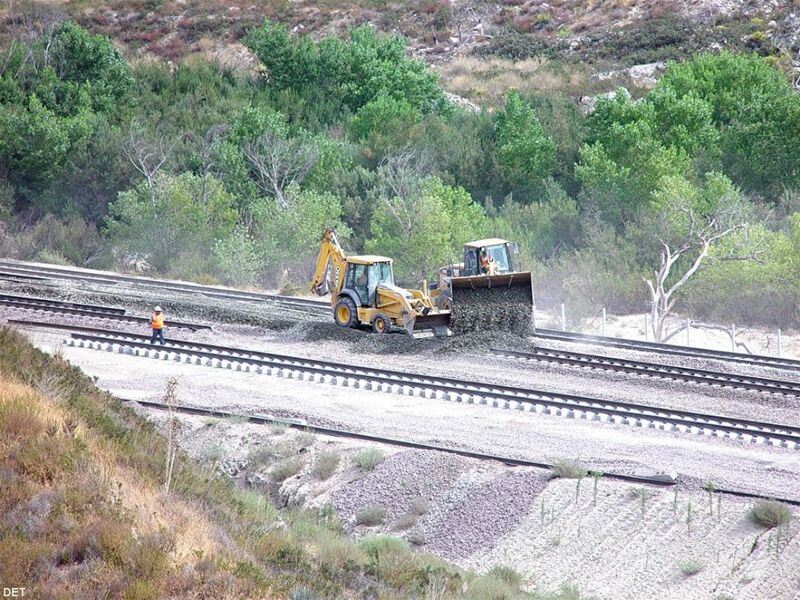 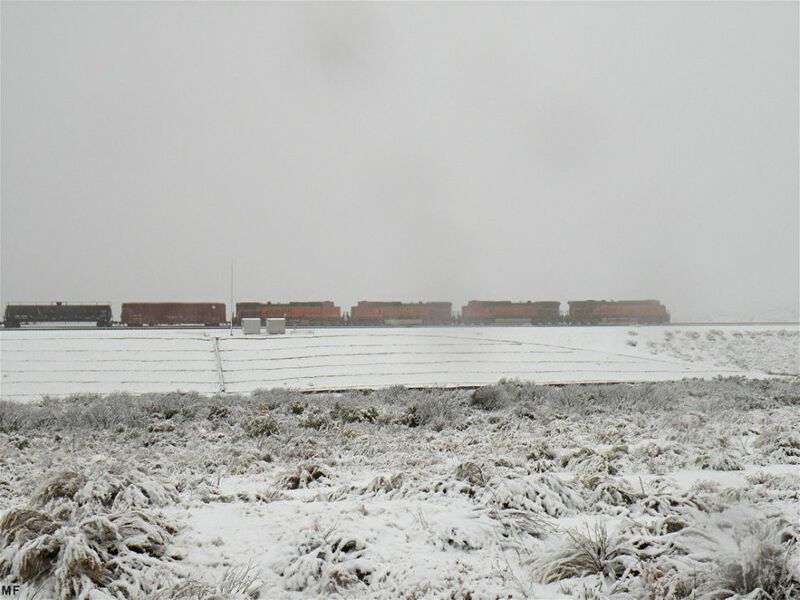 We can see trains now on 3 BNSF tracks and 1 UP track at different locations throughout the Pass.. 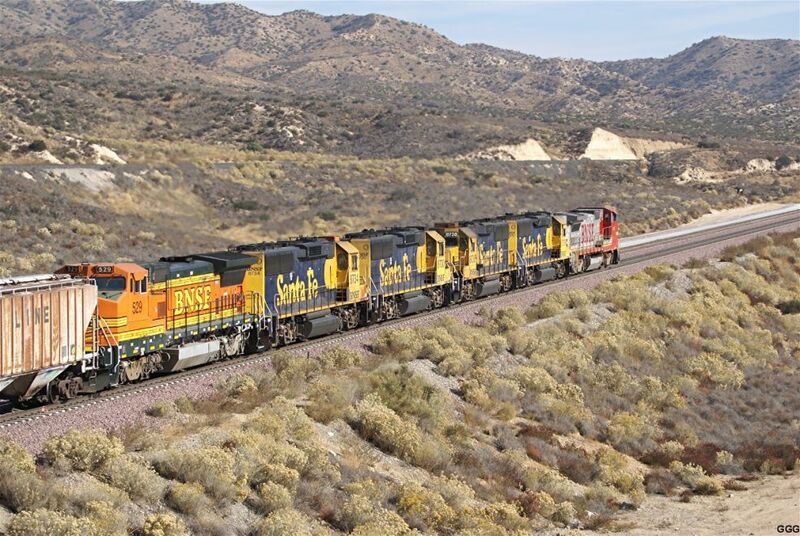 Photos 855 - 860: Sullivan's Curve is always a spectacular place to see trains. 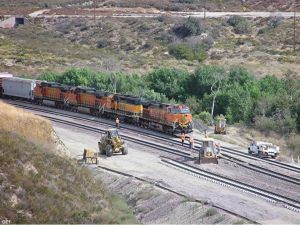 For those who are not familiar with this location, UP is having a siding here and therefore, we can see 4 tracks: UP Main and Siding, BNSF Main # 1 and # 2. 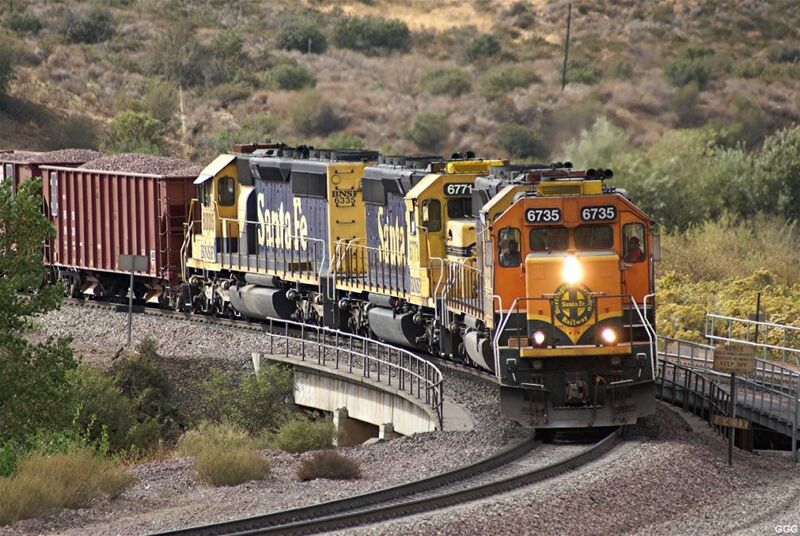 We are waiting for the ultimate shot with a train on every track! 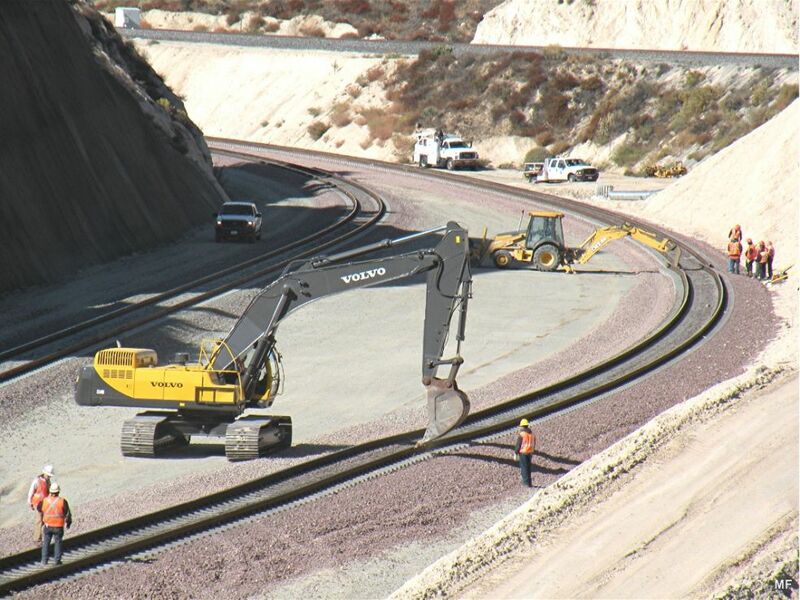 Photos 861 - 864 were all taken from WSI (West Summit Island). 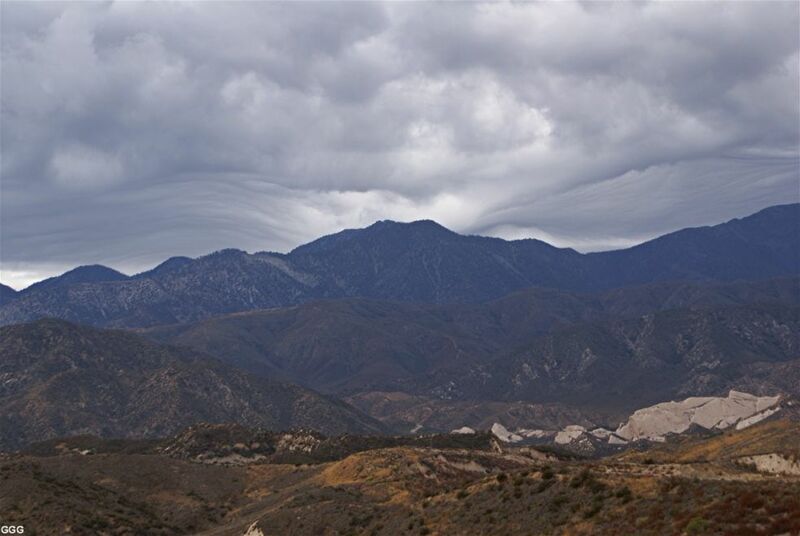 Photos 865 - 866: Two interesting weather shots from Hill 582. 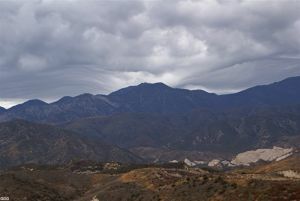 San Gabriel Mountains in the background. 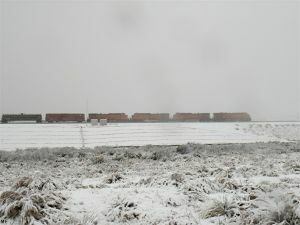 Maybe we'll get some snow/rain this year ?? 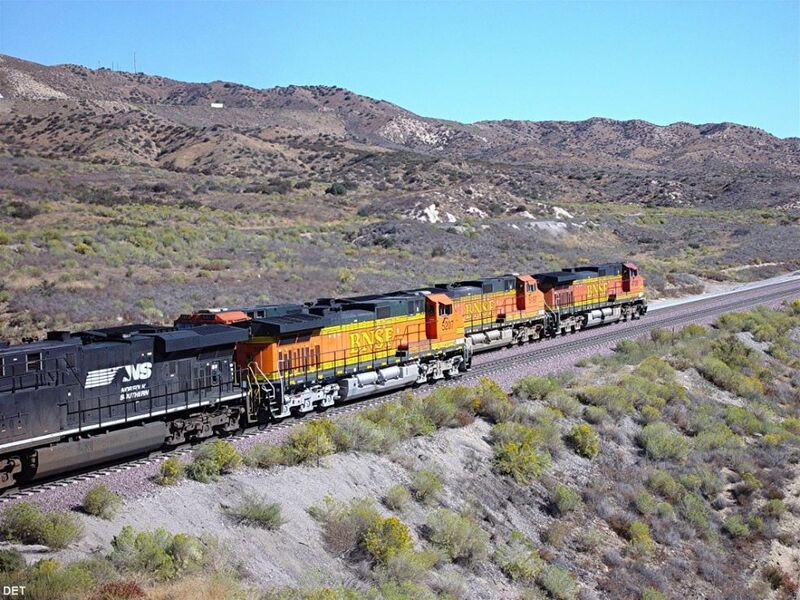 Photos 872 - 881: BNSF has installed a switch on the south side of Main # 2 just RR West of Walker. The switch is evidently for a "Set-out" track. 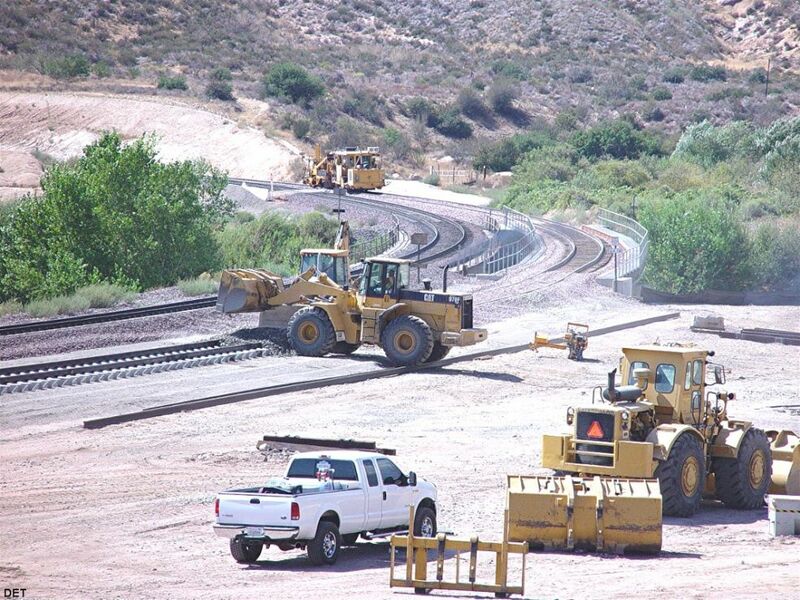 Photo 873: Dust mitigation has been of primary concern throughout the 3 MT construction. 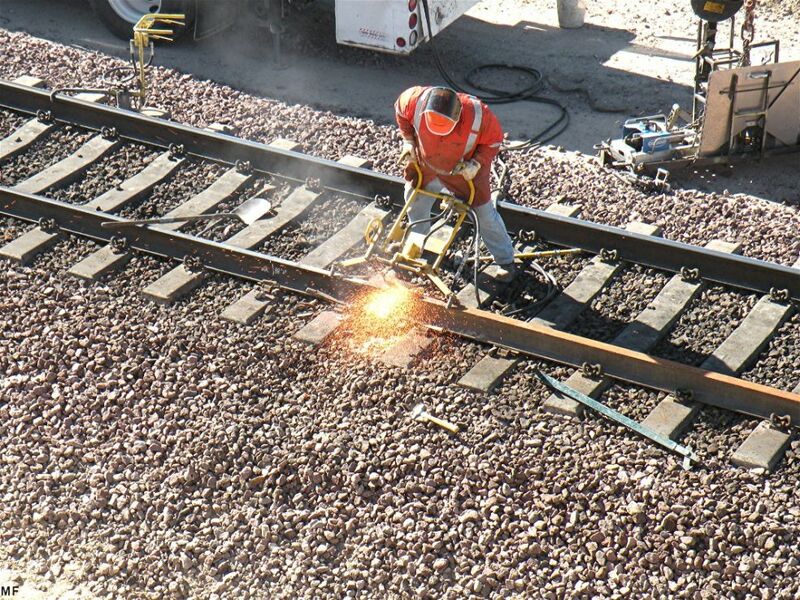 Photo 878: Hand throw Switch welded into position. 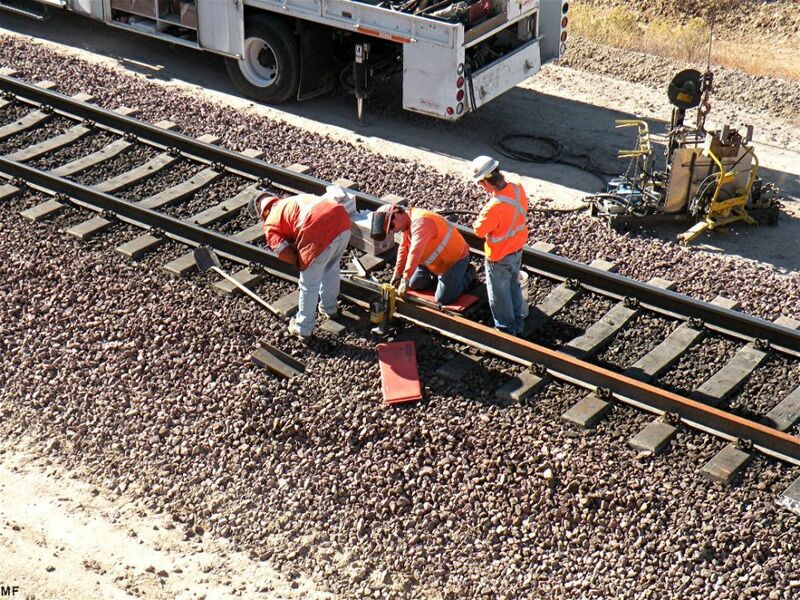 Unknown if the remaining panels will be used to extend the "set-out" track. 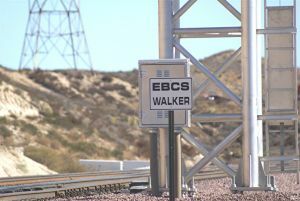 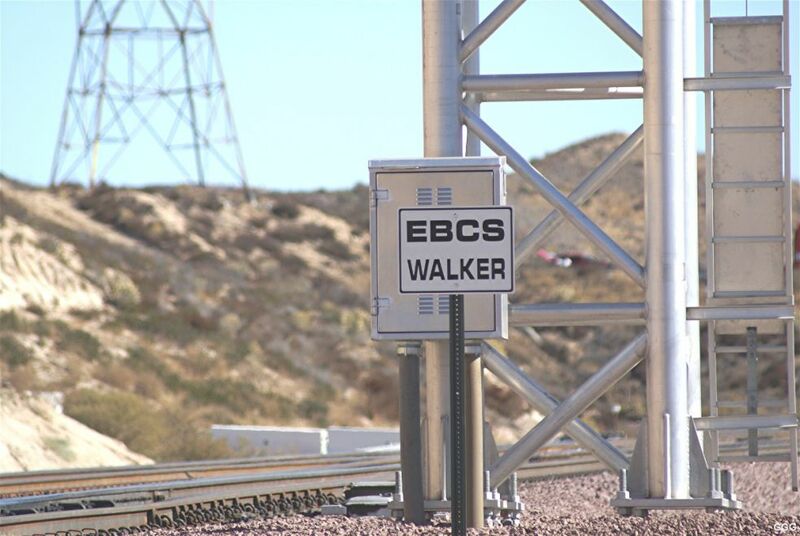 Photo 879: BNSF has installed the WALKER SIGNS on the East/West Bound Control Signals honoring our friend Chard Walker. 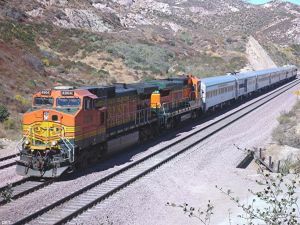 Photos 880 - 881: BNSF 529 and a brace of GP 60's lead the JAC-BAR EB at Walker. 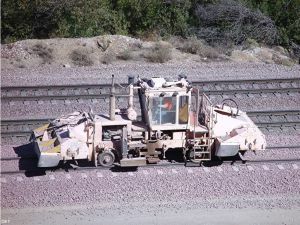 It is just rolling over the switch. 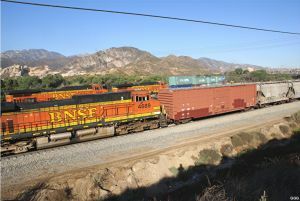 Photo 882: BNSF 4051 is EB in the old Tunnel 1/Shoo-fly area (MP 59) on Main # 2. 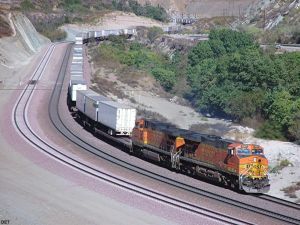 Photos 883 - 884: BNSF 556 leads DOTX Track Geometery Car 217 EB past Hill 582 on Main # 1. BTW, 217 is self propelled however it is designed to operate also in the towed configuration. 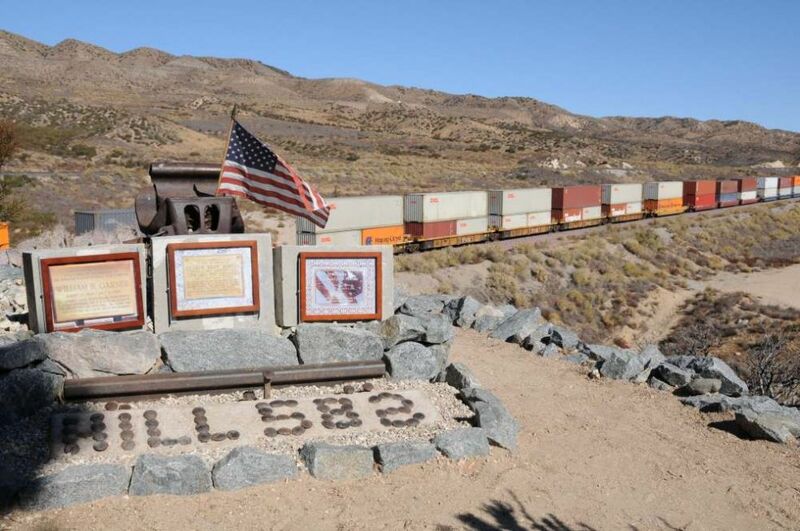 Photos 885 - 890: Another Swiss, Rudolf P. Schai, jr., visited Hill 582 on Sunday, 11/16/08. He is an active member of the American Railroadfans in Switzerland. 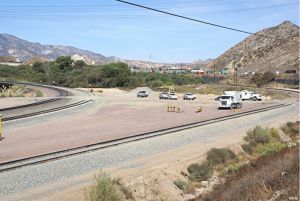 He really enjoed his stay on our "Oasis" in the middle of Cajon Pass. 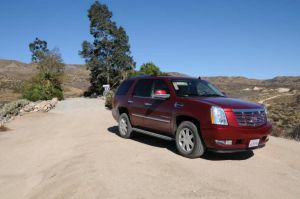 As he was traveling in style, we saw the first Cadillac Escalade on the Hill. Thank you, Ruedi for sharing your photos on our site (WM). 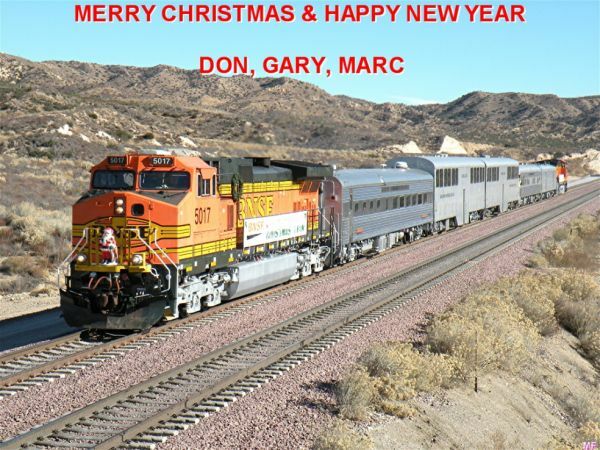 11/21/08 - Don, Marc and I spent Friday morning on Hill 582 and at CP Walker. 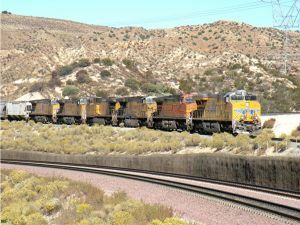 Not a whole bunch of trains but great company and a very nice day. Photo 894: BNSF 4776 is WB on Main # 1 past the thermite welding crew --- welding the setout switch to Main # 2. 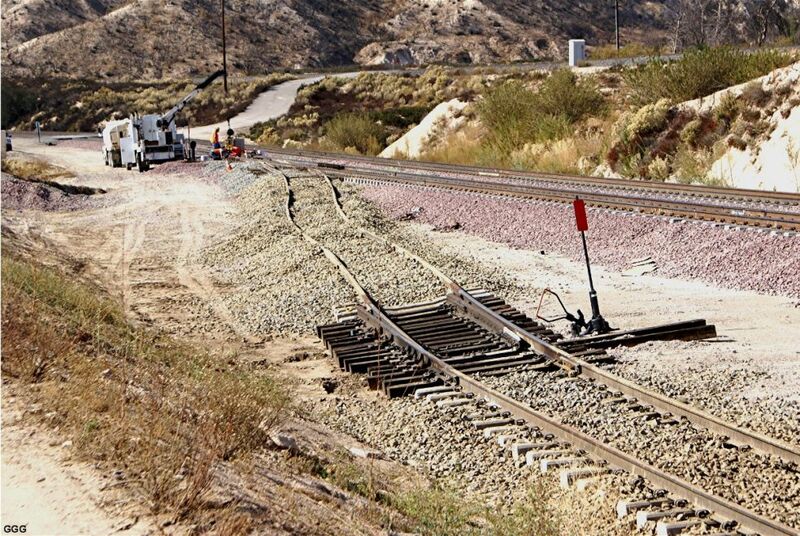 Photo 895: Looking RR west toward Davis Ranch Road, the derail and Main # 2 switch (both hand throws) are pictured. 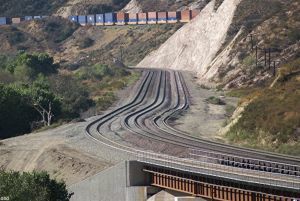 Photo 896: Looking RR East, the length of the setout track is pictured. 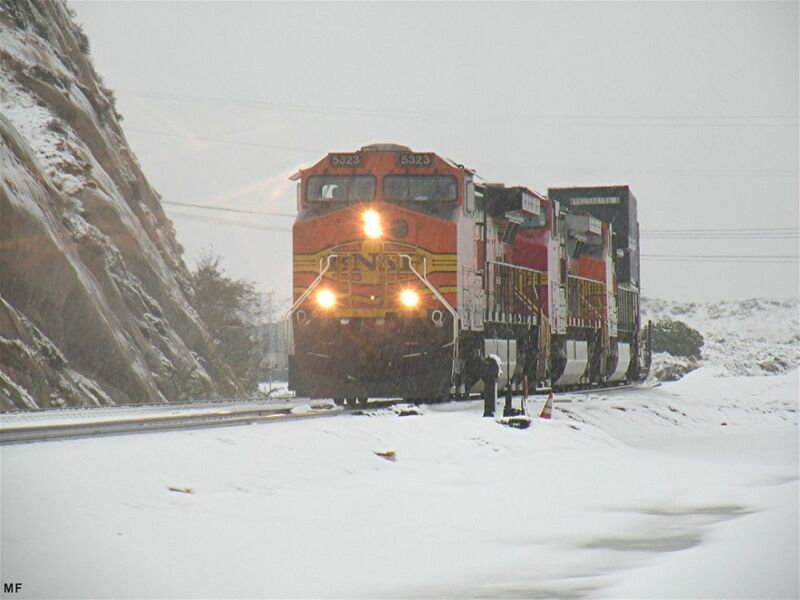 Photos 897 - 902: It has been and interesting week with rain and snow and really COLD weather. 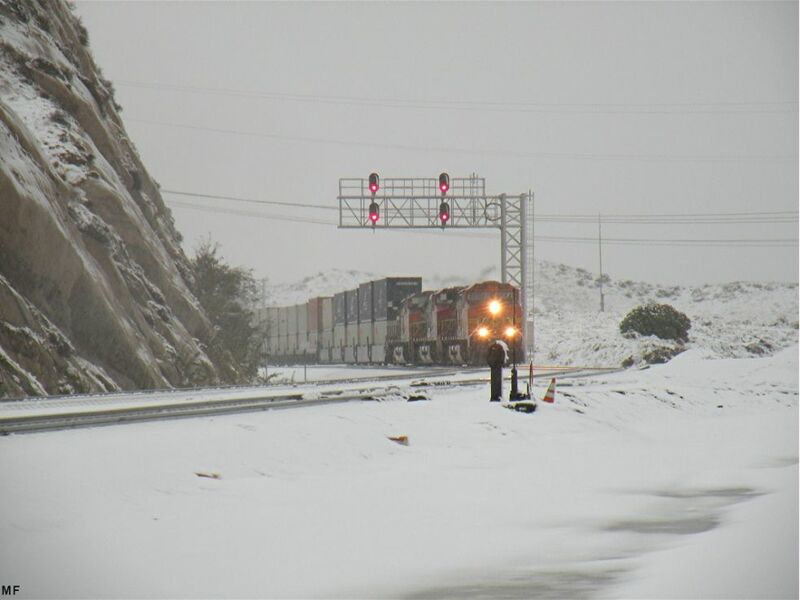 It was a relatively light snow but for Southern CA, it was a bunch. I-15 on Cajon was closed for several hours but our own Marc Fournier ventured into the Cajon with his camera. 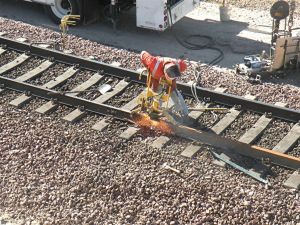 Rail traffic has been light = probably due to the economy but he did spot a few. 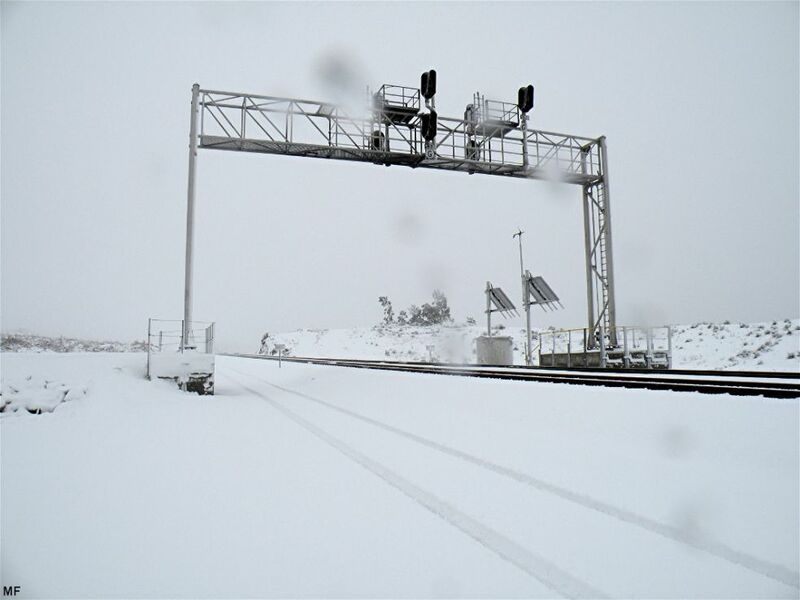 So, here are the "fruits" of his work in "Winter Wonderland". 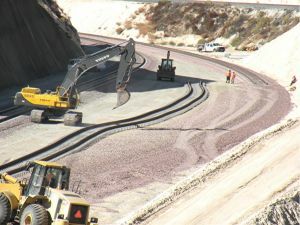 With these photos we are going to close our 3MT construction pages. 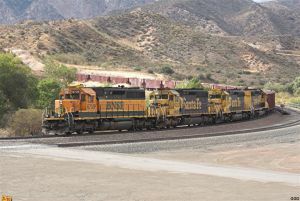 Once again a big thank you to our great photographers for being able to show all these exiting moments of this "one of kind" project. 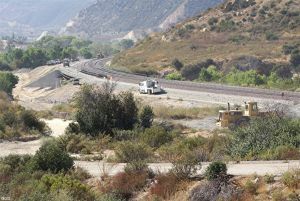 Do not worry, we are going to show new photos of Cajon Pass action in our Cajon Pass Photo Collection pages. Just go to the Cajon Pass Main Page and scroll down - click here.